so long as this website is cited. 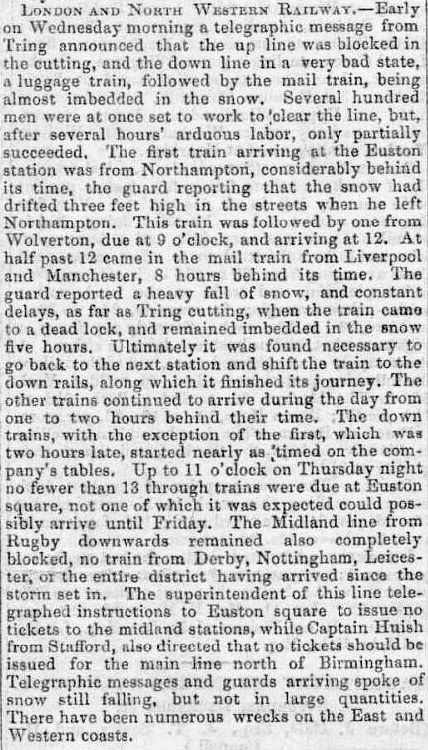 The opening of the railway from Euston to Tring, The Bucks Gazette, October 1837. We doubt that many, if indeed any of the travellers that pass through Tring Station spare a thought for its history. Why should they? With the possible exception of the adjacent Royal Hotel the station offers nothing that is likely to arouse historical curiosity. Austere functionality now pervades the scene. As for the railway today, it bears little resemblance to that constructed by Robert Stephenson and his team of civil engineers with their contractors and gangs of navvies. 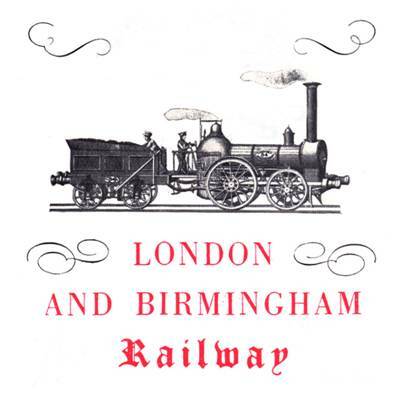 The following account makes no claim to be a detailed treatise on the history of the London and Birmingham Railway. * It aims instead to provide readers interested in the history of the town with a résumé of events leading up to the Railway’s arrival at Tring in October 1837, to the construction of the town’s station, and some points of general interest concerning travel in the locality in that age. Our narrative is in the form of a compilation of notes and historical extracts taken from the sources listed at the end of this booklet. We would be interested to hear from anyone who can add further information on the history of the London and Birmingham Railway in the locality. Our thanks go to Michael Bass, Chris Reynolds, John Savage and Russell Burridge, and to staff at the Buckinghamshire Centre for Local Studies and the Hertfordshire Record Office for their kind assistance. * For a more detailed account of the Railway’s history see . . . . The Train Now Departing. “The Bill for the new London & Birmingham railroad has at last passed through both Houses of Parliament. For nearly three years since the original scheme was first drawn up, the struggle has gone on. The greatest opposition has come from the large landowners of Hertfordshire, viz. Lord Essex, Lord Clarendon, Lady Bridgewater, Sir Astley Cooper and others. 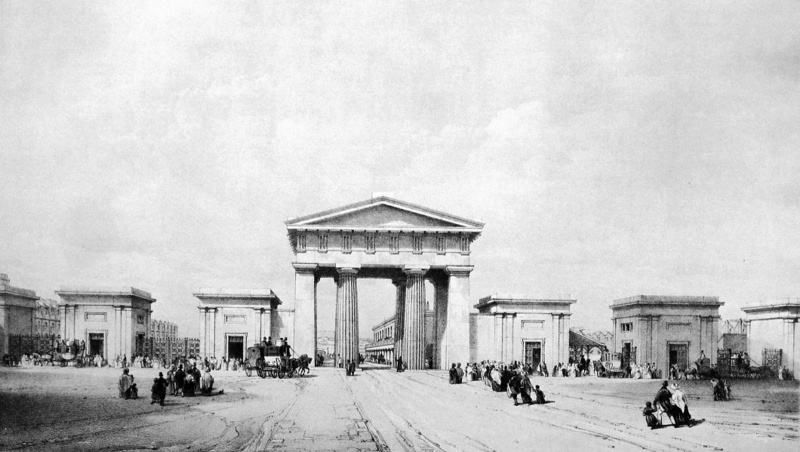 The London and Birmingham Railway Company required the authority of a ‘private’ Act of Parliament before construction of the line could begin. Among the privileges that such an Act conferred on the Company was that of compulsory purchase, the ability to buy land without the owner’s consent, but at a fair valuation. However, influential landowners who did not wish to sell could oppose the Company’s railway Bill as it passed through Parliament, and they did. It is not easy to ascertain what the Company thought was a fair price for land in Hertfordshire. They estimated £183 per acre for land between Kilburn and Tring, and £71 per acre between Tring and Wolverton. However, the surveyors generally reckoned a reasonable price for agricultural land at that time to be £70 per acre. The Bridgewater Trustees received £76 per acre for land in Tring, Marsworth and Cheddington, and their tenant, Peter Parrott, £3.60 per acre, giving a total of nearly £80 per acre; and for 43 acres of land in Northchurch, Tring, Cheddington, Marsworth and Horton, they received £130 per acre. They also received the expenses they incurred in opposing the 1832 London and Birmingham Railway Bill, a sum amounting to £2,178. Mr. William Smart of Aldbury was paid £140 an acre and Captain Harcourt of Tring £120. Members of Tring Vestry appear to have considered the amounts awarded to these objectors to the railway scheme to be ‘tremendous’, but several other landowners did accept the railway company’s original valuation. 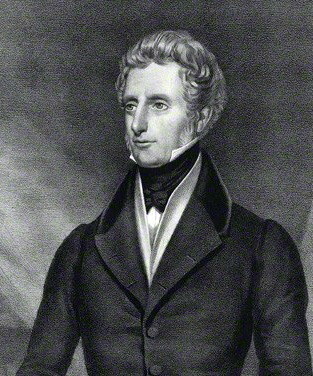 Railway opponent, Sir Astley Cooper Bt. (1768-1841). The London and Birmingham Railway, Roscoe and Lecount (1839). The Bill’s failure resulted in the Company wasting Parliamentary and other expenses amounting to £72,869, a huge sum for the time, and it caused outrage. In order to placate influential landowners who remained unwilling to sell – and thus avoid further opposition when their railway Bill again came before Parliament – the Company was obliged to pay them considerably above market rates. But when a further application was made to Parliament in the following year – a significant number of objectors’ palms having been greased in this way during the intervening period – the railway Bill went through almost unopposed and passed into law on the 6th May, 1833. Work could then commence, although the volume of detailed planning, the preparation of drawings and specifications, and the letting of construction contracts by competitive tender was a lengthy task, and it was to be a further 12 months before the first sod was turned. By the end of 1838, when the line eventually opened, the Company had paid out £537,596 for land against their initial estimate of £250,000. The great railway cutting at Tring is just one of a number of notable civil engineering features along the course of the London and Birmingham Railway. 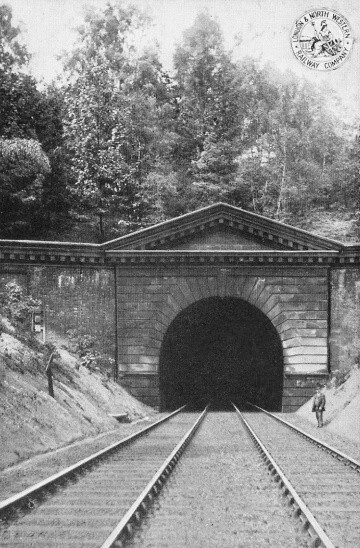 Completed almost 180 years ago, it is almost 60 feet deep in places and, at 2½-miles, is the longest cutting on the line. It took 500 men three years to excavate using picks, shovels and wheelbarrows, and helped along by horse power. In that time they cut through 1,400,000 cubic yards of chalk, which they then had to lift to the surface for disposal. This feat of pre-Victorian civil engineering was planned and carried out under the supervision of Robert Stephenson. Robert Stephenson was born near Newcastle-upon-Tyne, the only son of George and his wife Fanny. His mother died when he was two years old and Robert was then cared for by his father’s sister and housekeeper. George Stephenson (1781-1848), a self-made man of scant formal education, was a tough and ambitious father who was determined that his son followed in his footsteps. Robert received a good education including a short period spent at Edinburgh University, to which was added intensive engineering training. He soon became his father’s assistant, eventually working with him on projects such as the construction of the Stockton and Darlington Railway. 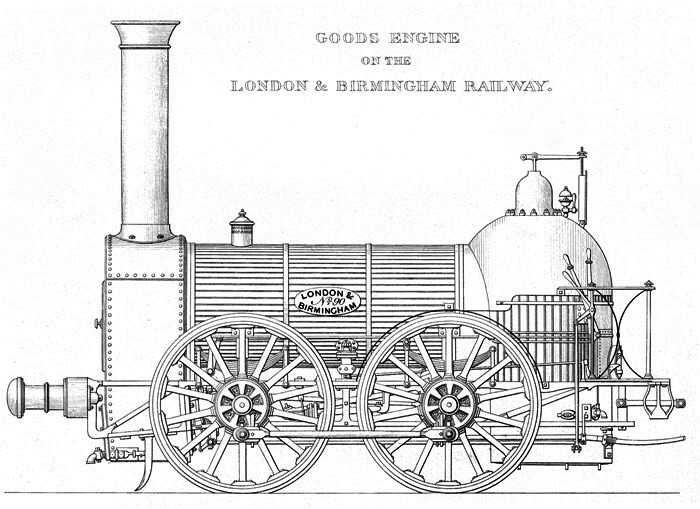 Following a 3-year mining venture in South America, Robert returned to England in time to oversee construction of the Rocket ― the locomotive that in 1829 won the famous Rainhill Trials ― in the process creating the basic locomotive design template for the remainder of the steam traction era. In 1830, the London and Birmingham Railway Company was formed and the civil engineering firm of George Stephenson & Son was appointed to make surveys, select the best route and carry the railway through the arduous process of obtaining a private Act of Parliament. Two outline surveys had already been made; one, via Quainton and Banbury, by John Rennie Jnr., the other, via Rugby and Coventry, by Francis Giles. Following a detailed examination of the ground, and with some alterations, the Stephensons recommended the route via Rugby and Coventry. This being approved by the Board, from then on George disappeared from the scene leaving Robert to take over the detailed surveying and planning of the line. Here, he had to tread a delicate path to avoid upsetting more of the landed gentry than necessary, for this was an age in which they held very considerable influence and the line would inevitably cross some of their estates. Stephenson’s preferred choice of route for taking the railway over the Chiltern Hills was along the Gade Valley from Two Waters, through Hemel Hempstead, Gaddesden and Dagnal and then on to Leighton Buzzard. This route crossed land owned by, among others, the influential Earl of Essex and the trustees of the Bridgewater estate, and it aroused such opposition that the Company was forced to find an alternative. Stephenson’s second choice was to follow the Bulbourne Valley through Berkhamsted and to the east of Tring. 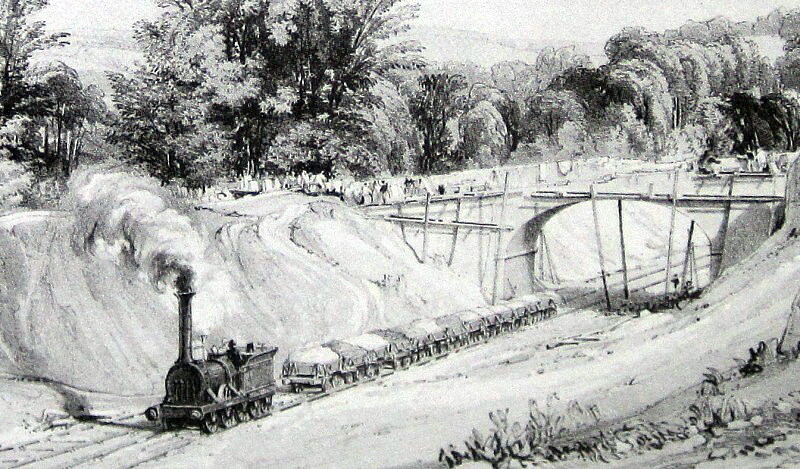 However, taking the railway through the Tring Gap required the construction of a long and deep cutting to enable the railway’s maximum gradient to fall within Stephenson’s target of 1:330 (16 feet to the mile). crossing the ridge of the Chilterns through the Dagnal Gap. Having obtained their Act of Parliament, the Company appointed Robert Stephenson Engineer-in-Chief at an annual salary of £1,500 (later increased to £2,000 to equal that paid to Brunel, then building the Great Western Railway). Stephenson’s contract required him to devote virtually all his time to this exceptionally large and complex undertaking, during which, it is said, he walked the entire route 20 times. 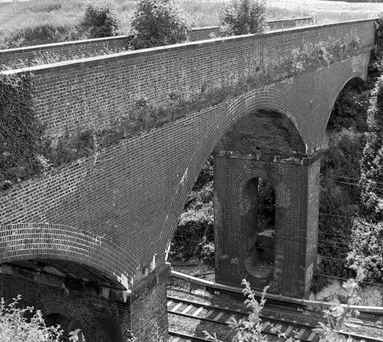 All manner of civil engineering difficulties had to be overcome requiring the construction of cuttings, embankments, viaducts, bridges (including difficult masonry ‘skew arch bridges’ that cross roads and waterways at an angle), cuttings (including two substantial cuttings at Tring and Blisworth) and tunnels, of which that at Kilsby in Northamptonshire is generally considered to be one of the most ambitious civil engineering feats of its age. Robert Stephenson’s gifts of leadership and organisation were needed during the difficult task of selecting and managing his project team, which eventually numbered sixty. He was supported by five assistant engineers, under whom were a team of sub-assistants, draftsmen and pupils (in effect, apprentices). The young men referred to themselves as ‘Stephensonites’ and remained loyal to their chief in later controversies and triumphs. A contemporary pen portrait tells us that Stephenson had “an energetic countenance, frank bearing, and falcon-like glance . . . . he was kind and considerate to his subordinates, but was not without occasional outbursts of fierce northern passion.” But the intense pressure of the work took its toll, for the account continues “during the construction of the line, his anxiety was so great as to lead him to frequent recourse to the fatal aid of calomel”, a toxic mercury-based chemical prescribed by English doctors at the time as a universal remedy. 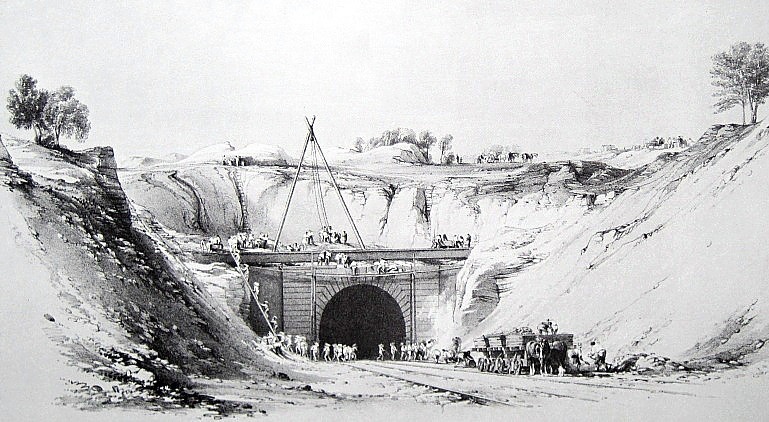 Watford Tunnel under construction, June 1837, by John Cooke Bourne. The railway opened in stages as work progressed; to Boxmoor, on the 20th July 1837; to Tring, on the 16th October; to Denbigh Hall, and to Rugby from the opposite direction, on the 9th April (the 38-mile gap being bridged by a shuttle coach service); and the line was opened throughout on the 17th September, 1838. In the meantime the Grand Junction Railway ― constructed, principally, by another famous civil engineer, Joseph Locke ― had reached Birmingham from Warrington, both railways sharing the same terminus at Curzon Street. There was now a continuous rail link between London and the North-West of England. Following the line’s completion, Stephenson’s career went from strength to strength. Among his engineering triumphs was the High Level Bridge across the Tyne (1849), the great Britannia Bridge across the Menai Straits (1850), and the 6,588-feet long Victoria Bridge over the St. Lawrence River at Montreal in Canada (1859). But the Dee Bridge on the Chester to Holyhead Railway was to cast a dark shadow over his later achievements, for on the 24th May, 1847, it collapsed while a train was crossing, causing in five deaths and nine serious injuries. After 1840, Stephenson was consulted increasingly on overseas railways schemes and began to travel a good deal. He also became engaged in public activities and in the development of his own business concerns, particularly the locomotive manufacturing firm of Robert Stephenson and Company based in Newcastle-upon-Tyne. In 1847, he broadened his interests further when he entered Parliament as the member for Whitby, a seat he held until his death. In politics, Stephenson was a Tory of the Right, hostile to free trade and anxious to avoid change in almost any form, which seems paradoxical in a man who was responsible for a great deal of economic and social upheaval. In 1842, Stephenson was again concerned with matters at Tring when he was consulted by the London, Westminster & Metropolitan Water Company on the feasibility of providing London with water from sources in the Chiltern Hills. His reports were lengthy and, as to be expected, well-reasoned. He stated “I am well acquainted with the chalk district between Watford and Tring, and it having devolved upon me, in the course of my connexion with the London & Birmingham Railway, to sink a great number of wells, my attention has been particularly called to the extraordinary quantity of water existing in the chalk . . . .” Perhaps fortunately for our locality, the water company did not pursue the idea of using the Bulbourne Valley to supply London. In later life, Stephenson acquired all the outward marks of recognition of a distinguished career. He declined a knighthood, as had his father, but was elected a Fellow of the Royal Society and served as President of both the professional bodies with which he was associated, the Institutions of Mechanical and of Civil Engineers. With his life’s work completed and the premature death of his wife, he became melancholy, sometimes peevish, and he often returned to visit his childhood haunts in the Northeast. His constitution, never robust, finally gave way, and Stephenson died on the 12th October 1859, aged 55 (Brunel had died a few weeks previously, aged 53). There was never any doubt about Stephenson’s burial place and 3,000 people packed Westminster Abbey for his funeral. The driver of the first engine used on the London and Birmingham line wrote to ask for a ticket – it is pleasant to record that he received one. “Please to inspect 1000 Black Beech Sleepers and let then be forwarded to Tring” – R. Stephenson. Robert Stephenson built the London and Birmingham Railway in accordance with his father’s strict engineering principles as evidenced by the line’s gentle curves and gradients, both of which are conducive to high-speed running. 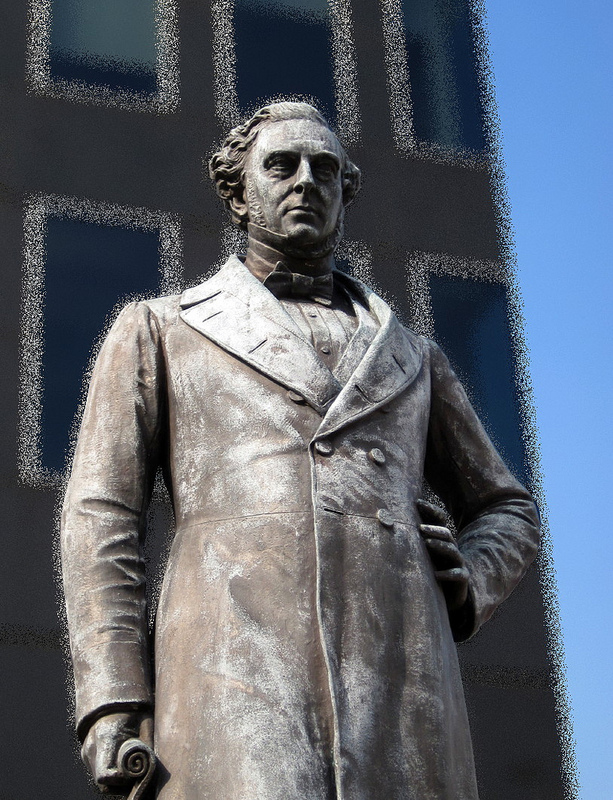 All those who travel through Euston Station and who walk out onto its forecourt can see a fine bronze statue of Robert Stephenson (below) – and those few travellers who do not hurry past with heads down might pause for a moment or two before it to pay their respects to his memory. Statue (1871) by Carlo Marachetti, Euston Station. 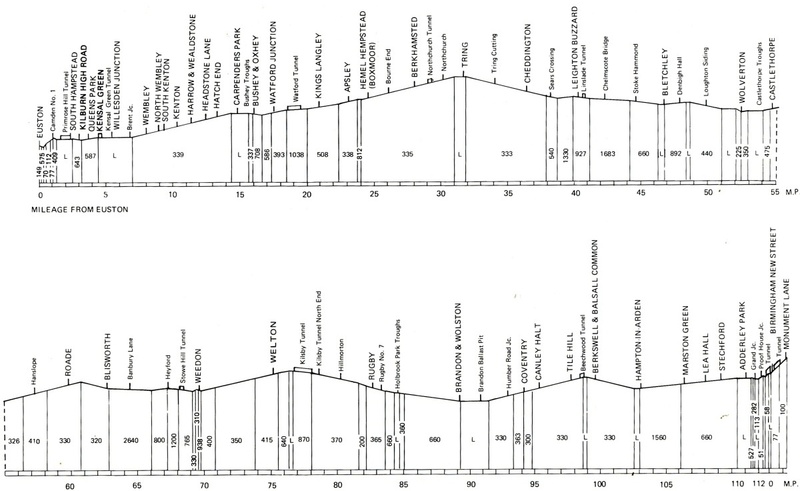 Euston to Birmingham gradient profile. At Birmingham, the line originally terminated at Curzon Street, about three quarters of a mile north-east of New Street Station. The following notes relating to the railway at Tring were written by Arthur MacDonald Brown (usually known as Arthur MacDonald) some time during the late Victorian era. They were intended to form a section of a published book on the complete history of the town, and it is apparent that he put much time and effort into its research. However, although some sections are detailed, others comprise rough notes that were probably awaiting further research before being written up. Much to the regret of today’s local historians the book was never completed, for as MacDonald said, “I have quailed at the task of putting them [the notes] into proper shape for a parish history, but have amused myself in old age by utilizing some of them in a gossiping narrative.” In 1940, he did just that when he published a small book entitled That Tring Air to help raise funds for the Tring Nursing Association. This transcription of MacDonald’s section on the railway is taken from his original writing and, apart from some editorial notes [bracketed in italics], the extracts appear exactly as he wrote them. In some places they contain their author’s quaint Victorian turn of phrase, in others his rather anecdotal style. 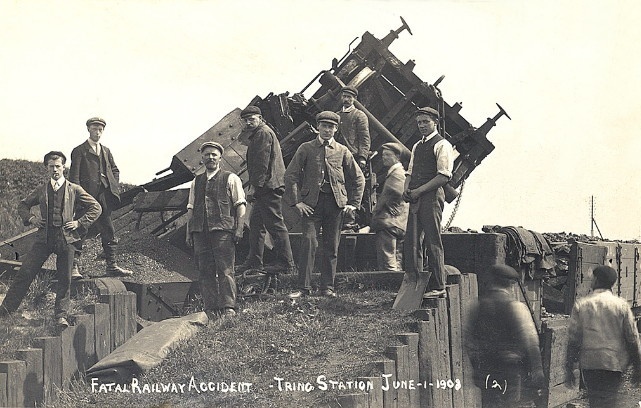 It may well be that modern research and the findings of later writers and railway historians call into question some of the facts and information, but in essence the story of the coming of the railway to Tring remains unaltered. 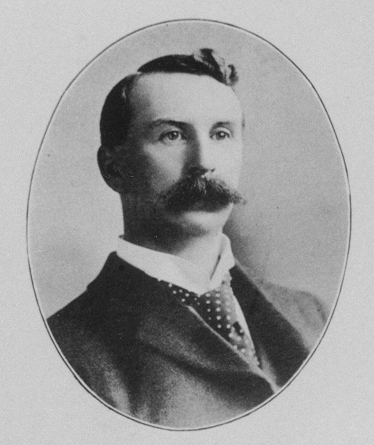 Although his image (enhanced by a typically late Victorian heavy moustache) suggests a serious gentleman, it probably belies a more light-hearted character, for he also wrote a number of humorous poems, songs and sporting ditties. Arthur MacDonald was the second son of William Brown, a land agent of Tring, who founded the local firm of estate agents, Brown & Merry. After attending Berkhamsted School and Jesus College, Cambridge, he became a partner in the family firm in which he fulfilled a distinguished career. He was an expert in ecclesiastical and lay tithes, as well as in estate management, also undertaking the role of Examiner in Surveying for the Civil Service. Notes written by Arthur MacDonald (Brown) c.1890. In October 1837 the London & Birmingham Railway, now the London & North-Western, was opened to Tring. Two companies were formed in 1830 to form lines from London to Birmingham; one by Oxford and Banbury, the other by Coventry. They amalgamated and on George Stephenson’s advice chose the latter route. The first survey had been made in 1825, but the commercial crisis of that year stopped further progress. The final surveys were made in 1830 and 1831, and Robert Stephenson is said to have walked over the ground no less than 20 times in selecting the best route. Of course the engineering difficulties were the lightest obstacles that had to be overcome. The opposition from all classes was almost overwhelming. The surveyors had exciting times, and had often to adopt stratagems to get their work done. In one case the owner was so determined in keeping them off his land, and so vigilant in his determination, that the necessary levels had to be taken in the middle of the night, with a dark lantern held on the instrument and another to the staff. Another Reverend owner had to be circumvented by being watched safely into the pulpit, when the work was snatched. In not a few cases it came to a pitched battle, and the invaders had to get navvy protectors. The Route – the direct route from Watford to Leighton would be by way of Hemel Hempstead and the Little Gaddesden and Dagnal valley, but we have to thank the powerful opposition of the landowners in that district for turning the line out of its course down the Berkhamsted valley and so by Tring. The opposition to the line was by no means confined to the landed interest; public meetings were held at many places, protesting against railways in general on every conceivable plea. The tradesmen foresaw the loss of all their business, those who lived within a mile or two of the line expected their houses to be set on fire, the air was to be poisoned, all horses were to emigrate, and all cattle were to be frightened to death. There is said to have been a public meeting held at Tring to protest against a proposal to bring the line from New Ground to near Grove turn, this being considered dangerously near. They changed their tune when the line was being made, and wanted a branch, but the opportunity had passed. The Bill was thrown out by the House of Lords in 1832, seven-eighths of the owners along the line being dissentient. It was brought in again however and passed in 1833. The average cost of the land was £6,300 per mile, which at one chain wide is equal to nearly £80 per acre. The cost on other lines varied from £3,000 to £14,000 per mile. 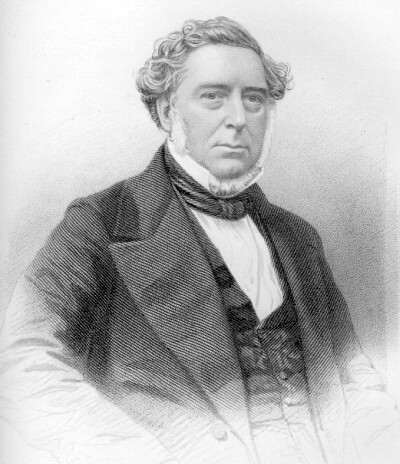 Robert Stephenson was appointed engineer-in-chief. The section from Camden to Tring was completed first, Camden being originally intended for the terminus. The Contractor for the section from Tring to Leighton was named Townshend; he was one of the unfortunate eleven out of the eighteen contractors who became bankrupt over the business. Contracting on such a scale was new, and the ins and outs of estimating were little known. There were no leviathan contractors of the modern Lucas & Aird type [an engineering company founded in 1848 and trading until 1990]. The Tring Cutting – the largest on the line, is well known as a stupendous engineering work, and nearly approaches the limit of depth at which tunnelling becomes preferable. It passes through the flintless lower chalk ridge of Ivinghoe for nearly two miles and a half. Its average depth is forty feet; for a quarter of a mile it is 57 feet; a million and a half cubic yards of chalk were removed when it was first made, and they form an embankment to the north six miles long and 30 feet high, besides huge spoil banks of superfluous material. The work was commenced at Pitstone end, and took nearly three years. The method of raising the chalk was peculiar and attended with no little danger. 30 or 40 horse-runs were erected – steep inclines made of three or four planks side by side wide enough for the legs of a barrow to stand on, placed down the slope of the excavation. In the field at the top was a strong post with a pulley upon it; over this a horse drew a rope and chain which passed down the slope and was hooked on to the barrow. When the barrow was full, the word was given, the horse was trotted out into the field, the navvy hung to the handles of the barrow and ran up the planks in an almost horizontal position, taking his chance of a lump or two falling back on him. Any irregularity in the motion of the horse, and down went the man, barrow and all, and he had to be very quick to escape falling under it. All the men were precipitated to the bottom many times, but such is the toughness of the British navvy that there was only one fatal accident. The engineer, seeing the great risk of the method, invented a kind of lift consisting of a small tram on lines carrying two barrows, but this the men disapproved of and broke, preferring the old method to a labour-saving contrivance. 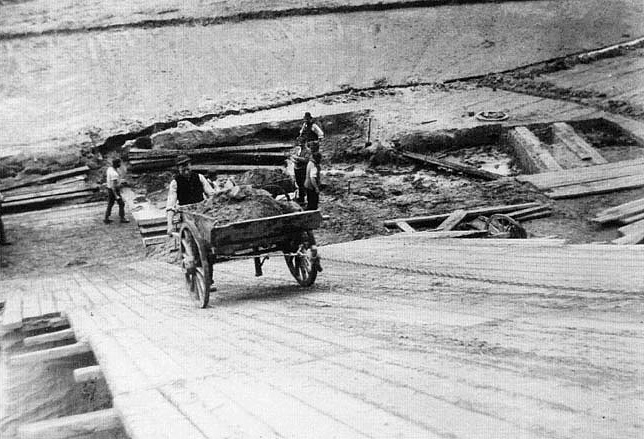 Horse (or barrow) run in use on the Manchester Ship Canal. System of ‘ganging’ – the price per cubic yard paid to the men varied with the depth from seven pence to a shilling, and the men formed themselves into corresponding gangs of from seven to twelve, each man thus taking a penny per yard raised by the gang. The contractor found the horses and runs, the men undertaking to dig, raise and deposit the chalk. One of each gang acted as ‘runners’, and they could run 100 barrows in a hundred minutes up a 90 ft plank. The ‘diggers’ too had their dangers. The practice was to undermine a length of some yards, leaving one or two pillars of chalk or ‘legs’ to hold it up, then to cut away the legs and by driving piles into the top, bring down the overhanging mass. A well-known old inhabitant of Tring, Bunce, was engaged in this work, and was cutting away a ‘leg’ when the mass came down. He and his mate were buried in the falling chalk up to their shoulders, but escaped without broken bones. Townshend’s [Thomas Townshend, 1771-1846, civil engineer and contractor] section commenced about 200 yards north-west of Tring Station; Cubitt [Sir William Cubitt, 1785-1861, founder of W. & L. Cubitt, civil engineers] taking the nine-mile Kings Langley to Tring section [according to company records, the Cubitt contract terminated at the northern end of Northchurch Tunnel, the short section between the Tunnel and Tring Cutting (contract 6B) being let to Richard Parr]. The bridge at Northfield has always gone by the name of the ‘bird-house bridge’, from the circumstance of a Dwight from ‘the hills’, one of the originators of the pheasant breeding business [Matthew Dwight, game farmer], bringing a hut on wheels or ‘bird-house’ down to that point, where he lived and sold beer to the navvies. The regular navvies or ‘old hands’ commenced the cutting, and thought they could do it without assistance, but it was found necessary to employ quite an equal number of local men when the work got deeper, and they soon showed that they could hold their own with the old hands, not only at digging, in which Tring men have always excelled, and still do so, but at this (to them) new practice of ‘running’. This excited great jealously among the old hands, which rankled in their minds long after, and on other works a Tring man was in danger of getting his head punched if the others knew where he came from. Former stone block railway sleepers in use as boundary markers at New Mill, Tring. The two holes in the top of the block on the right were to hold the oak peg fasteners for the rail chair. The other blocks are up-turned. More former sleeper blocks are in use as coping stones on the nearby canal at Cooks Wharf. 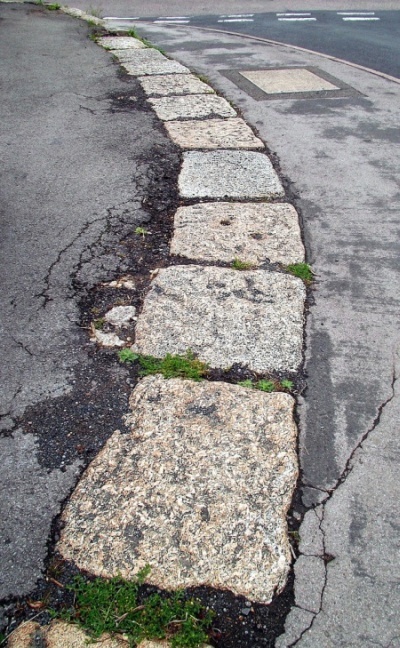 A section of line laid on stone block sleepers. Altogether there were about 500 men employed in the cutting, and they brought some life of a curious character into the neighbourhood. Ivinghoe was Mr Townshend’s headquarters and pay office, and many of the men lodged there and at the other villages near the line. There was a lively party of eight at The Bell in Tring, who occasionally gave some trouble to the authorities of public order. Mr Bull and Mr Philbey were Parish Constables at that time, and the former was called in on several occasions when the navvies were having a row, when he laid about him with his staff of office in a highly business-like and effectual manner. Mr Philbey, too, had the faculty of arriving with great celerity on the scene of action – he drove furiously a small pony cart and was familiarly but irreverently called ‘Flying Issac’. During the excavation many fossils were found, chiefly oysters, nautili, ammonites etc. also numbers of concretions of iron pyrites, popularly known as ‘thunder bolts’, some spherical and some cylindrical, but most irregular and fantastic in shape, and all with the common radiating structure. At the Icknield road bridge 15 or 16 skeletons were found, and some Roman pottery. Two urns were found at the Pitstone end, and these are now said to be in the possession of the Antiquarian Society. The first locomotive – the first locomotive was brought down in pieces by canal, and housed in a barn at Pix Farm, beyond Berkhamsted until wanted. It was a heavy 6-wheeled engine, used to test and consolidate the line and was called the ‘Harvey Coombe’. There was great excitement to see this wonderful beast when it took its first run down to Tring. One old wiseacre who had been working at the cutting refused to go with the others to see it, remarking that it was ‘Harvest home’ rather than ‘Harvey Coombe’, meaning that it was the signal of their job being finished. This ponderous joke, after a life of 50 years, is still repeated by the survivors of that time with brimming hilarity. Tring Station – it was the intention of the Company to place a station at Pitstone Green at the north-west of the cutting, and perhaps another at New Ground. 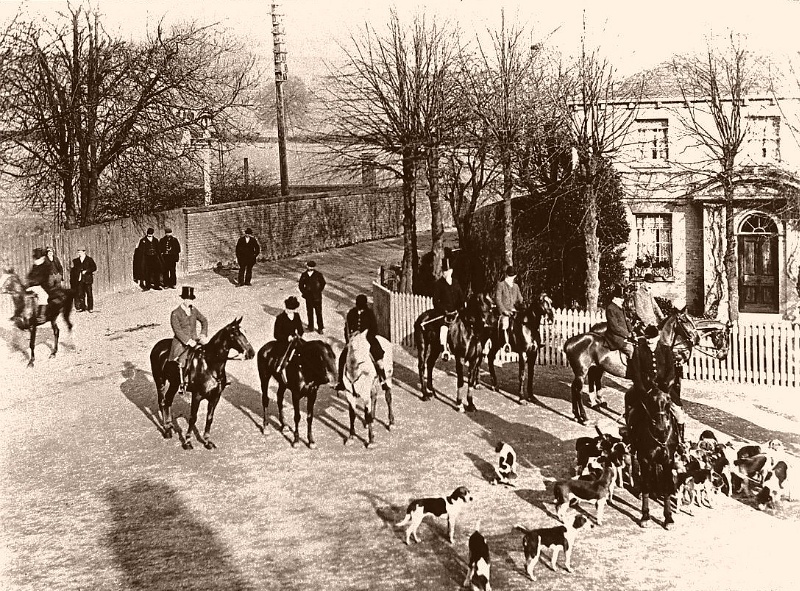 The leading inhabitants of Tring, however, finding their town about to be left out in the cold began to agitate for a station at Pendley, but the owners of the Harcourt estate had made such opposition to the line and asked such a high price for the land, that the Company had taken as little of it as possible. A public meeting was held at the Rose & Crown to memorialize the Directors. Their reply was that if the land could be obtained at a fair price they were quite willing to make the station at the desired point, but that they were not going to pay a fancy figure, and if the town wished it, they must get the land and if necessary pay the difference. 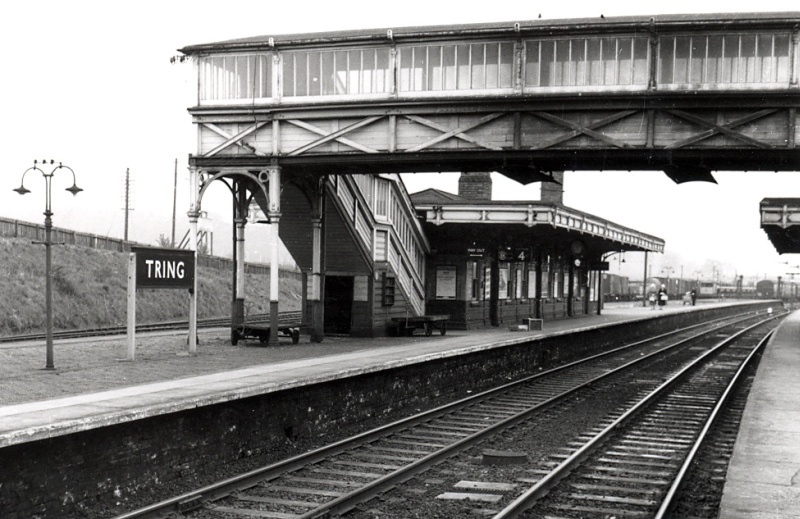 There was some idea of calling the station Pendley, but the name Tring was adopted. The Station Road was soon formed, and our little town was thus put into railway communication with the outer world after so many vicissitudes, and its station turned out to be one of no mean importance on the line. It was selected as a principal or first-class station at which all trains stopped, on account of its being at the highest point of the line, and an engine being usually thrown off here, also on account of the purity of the water, which did not fur the boilers. The level of the rails at Tring Station is about 330 feet above the line at Euston, and 420 feet above the level of the sea. It is thus about level with the top of St Paul’s. There is only a short length of the line in Tring Parish (a mile and four chains), from the Northfield or ‘Birdhouse’ bridge to the Icknield Road bridge at the Folly Farm. The Station is in Aldbury parish. Aylesbury Branch Line – was constructed by a private company formed at Aylesbury in 1835, the first intention being to leave the main line at the proposed Pitstone Green Station, passing on the south side of Cheddington Hill by Long Marston and Drayton Beauchamp. When Tring Station was secured, it was to have been made the junction, the branch leaving the main at the Pitstone end of the cutting as proposed. Finally, Cheddington was chosen as the junction, which has the advantage of being perfectly straight all the way and having no cuttings and very little embankment, and was opened on 18 June 1839. It was soon after purchased by the London & Birmingham Co. The opening of the line – the first portion of the main line completed was that between London and Boxmoor. This was opened in the summer of 1837, and the curiosity to see the new mode of travelling drew a large crowd to Boxmoor from all parts of the country round. Brass bands played, and many performed during the journey. 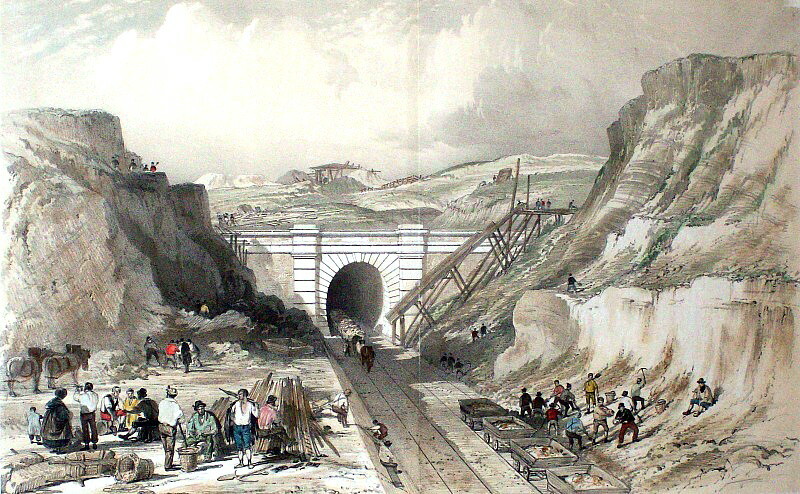 At the end of that year the line was opened to Tring, and in April 1838 the whole line was completed with the exception of the part between Rugby and Denbigh Hall (Bletchley), which was delayed by the great engineering difficulties encountered in making the Kilsby Tunnel. Omnibuses connected the two portions until the line was finished, and the first train ran through from London to Birmingham on 17 September 1838. In 1836 a Cheltenham & Tring Railway was being projected, this portion of the proposed route starting from Tring Station on the L&B by Grove, New Mill and Drayton, to Aylesbury and Thame. Tring, Reading & Basingstoke Railway was to have joined the London & Birmingham at Pitstone Green and passed near Buckland, Halton, Risborough and West Wycombe. A second Tring & Aylesbury line was to have left the L&B at the same point as the last mentioned, approached the old branch at Long Marston, and passed through the parishes of Weston Turville and Broughton. The Buckinghamshire Railway was to have gone down the Amersham and Wendover Valley, from Willesden to Banbury, along the same route from Aylesbury as the present, being intended to work with and relieve the L&B. The Oxford & Cambridge line would have passed by Aylesbury, Cheddington, and Dunstable. There was a Tring and Banbury Railway projected, this may possibly be the same as one of those mentioned above. Receipt issued in 1845 by the projected Tring, Reading and Basingstoke Railway Company. The company was dissolved in bankruptcy in September 1846. By an entry in the Tring Vestry book, 4 April 1845, it appears that application was made for power to rate in the usual manner a line which was to have passed through Betlow, this Lordship being under a special Act as to rating. The Railway was called the London, Worcester, & South Staffordshire and was to have run from the L&B at Marsworth to Worcester. In 1846 the London & Northwestern Railway was incorporated, including the London and Birmingham, Grand Junction, and Manchester & Birmingham lines. Later development. – When the L&B Railway had been opened 17 years, it was found that within a circle of two miles round each station between the Metropolis and Tring the total amount that had been expended in new buildings was only £22,000. It was then suggested that if a first class pass, available for a few years, were presented to every person who constructed a residence of a certain annual value near the line, all parties would be benefitted. In eight years, between £240,000 and £250,000 were spent in house-building in those localities, and the amount expended since has been enormous. Beech Grove, shortly before demolition in 1997. Above: an unrebuilt Royal Scot-class locomotive and train in Tring Cutting. Below: Midland Compound 1114 in Tring Cutting. Tring Cutting today (video clip). Stephenson was well aware that one of the most labour-intensive tasks along the route would be the excavation of the 2½-mile Tring cutting. 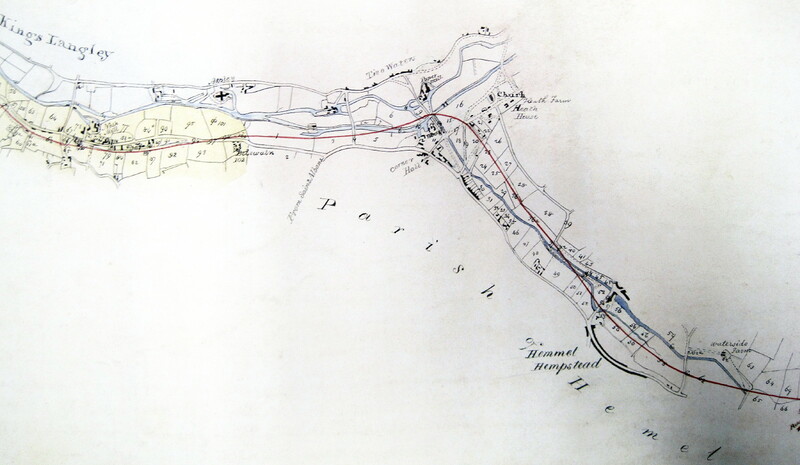 Thomas Townshend (1771-1846), an established civil engineering contractor from Smethwick, secured the contract to construct the 6-mile section of the line from a point to the north of Tring Station, his tender price being £107,250. Although approaching the end of his career, Townshend was very experienced in heavy earthworks, drainage and canal cutting, having earlier worked on projects for the great civil engineer John Rennie Snr. Townshend’s responsibilities were considerable. Not only did they entail the construction of the cutting, numerous bridges and the very long embankment to the north of the cutting, but he also had to build culverts and drains, erect fencing, and lay the rails, blocks, chairs and sleepers. All this he was required to maintain in good order for a year after completion. 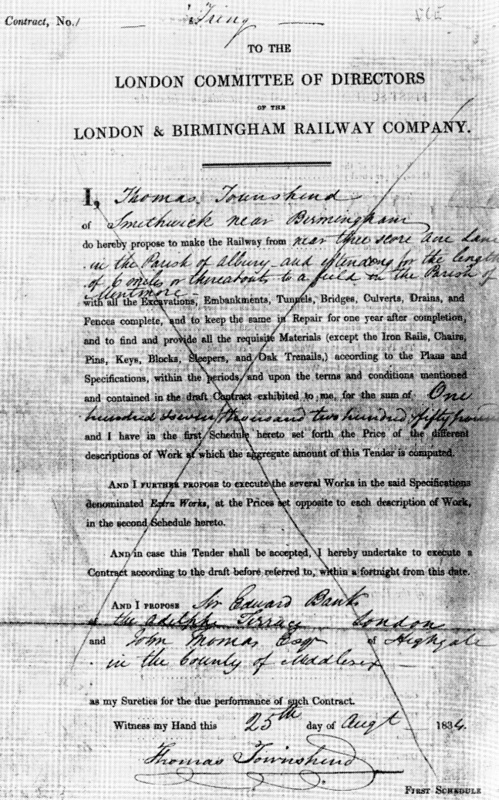 First page of the contract for excavating Tring Cutting and for other work, including the long embankment to the north. It was signed by Thomas Townshend on 25th August 1834. The contract price of £107,250 included keeping all the works in good repair for one year after completion. The Mechanics’ Magazine (vol.23) 1835. A History of the Railway connecting London and Birmingham, Peter Lecount (1839). 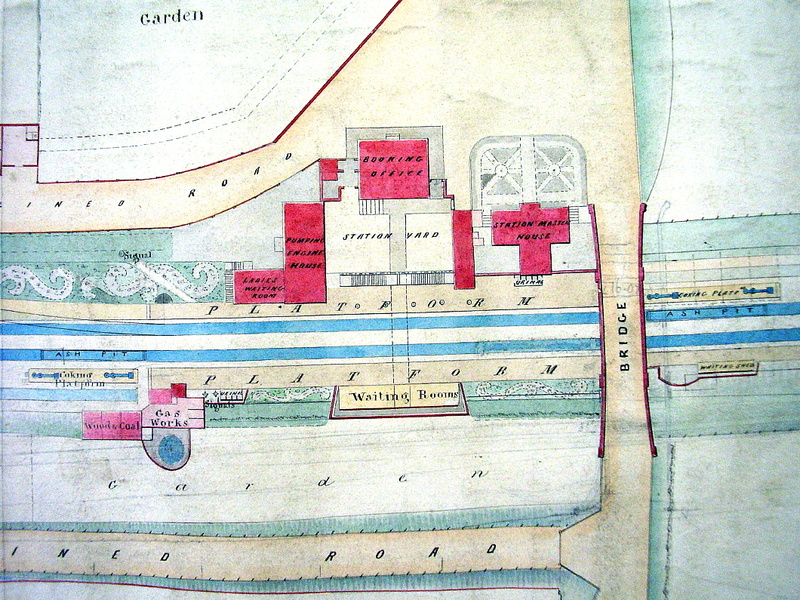 A further difficulty arose when the Grand Junction Canal Company claimed that the excavation had resulted in a considerable loss of water that would otherwise have flowed into the canal’s summit, which lies a short distance to the west of the railway cutting. 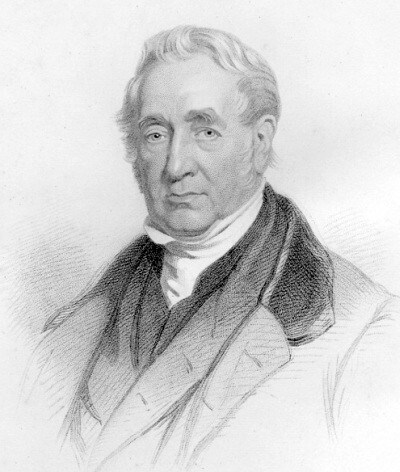 Although Stephenson had the flow measured and disputed the argument, the canal company threatened legal action. To settle the issue, the railway company undertook to build a tunnel through which drainage water could flow from the railway cutting into the canal’s summit, an exercise that added to the cutting’s expense. This pond – also known as “Bulbourne Water”, for it was quite a large expanse – was on the Grove Estate, at that time in the ownership of the Seare family. Sale of Thomas Townshend’s assets. Both advertisements appeared early in 1838. It is interesting to see the wide range of equipment that a railway contractor of the age had to provide, indicative of the private capital that was necessary to undertake such work. Auction of Townshend’s assets. The Derby Mercury, 24th January 1838. Bucks Herald, 7th January 1854. The cutting was eventually completed under the supervision of the Company’s engineers using some of Townshend’s staff to control the workforce, its final cost being £144,657 against the contract price of £107,250. To take on a civil engineering project, such as that at Tring, a contractor needed to engage an appropriately skilled workforce and provide them with a wide range of equipment. This is evident from the advertisements for the auction of Townshend’s assets, which give some idea of the amount of capital that a contractor required to set up in business. Further advertisements six months later imply that Townshend’s property was used until work on his contract was complete. 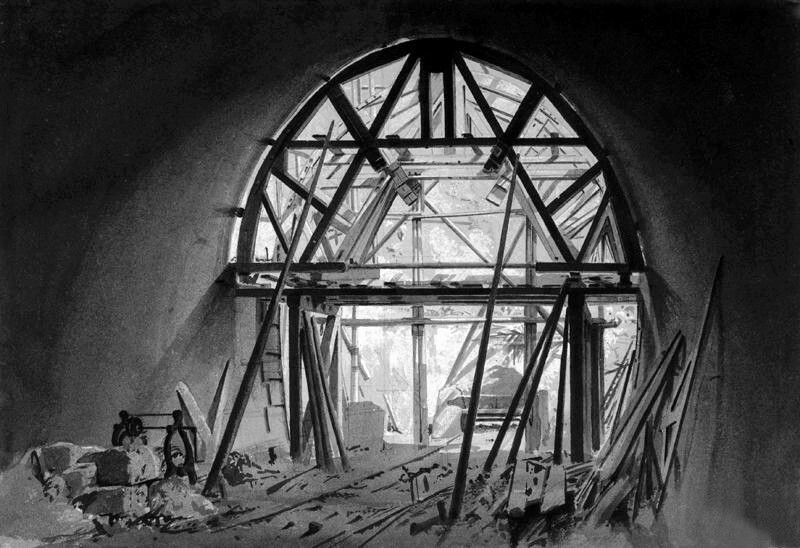 In June, 1838, a further sale was held at Pitstone, in which chain pumps, block cranes, a large Iron Crab windlass, timber and stone carriages, as well as materials from many temporary erections used to supply the needs of the dozens of horses (e.g the contents of several large stables), blacksmiths’ bellows, anvils, vices, and a chaff-cutting machine, were put up for sale. Farmer’s bridge near Pendley Cottages. A deep cutting necessarily entails the construction of road bridges, which require a small army of bricklayers, joiners and labourers. Four bridges cross the Tring railway cutting – at Tring station, a farmer’s accommodation bridge near Pendley Cottages, Marshcroft Lane and Bulbourne (Folly Bridge, where the cutting reaches its maximum depth). Little can be seen of Stephenson’s original bridges, for they were largely reconstructed when the cutting was widened in 1859 (to three lines) and 1876 (to four lines), and during the electrification of the line in the 1960s, but all remain three-span arches with a new 48 feet centre span. Jean Davis writes in Aldbury, the Open Village (pub. 1987) that a map of 1840 shows another bridge, which carried the church path across the railway. This bridge was later removed by the railway company to make way for further development, and the resulting compensation (£140) was used by Aldbury Vestry to build a house for the village school master. 14th March 1836. Boxmoor. A great riot took place here last night between the English and Irish Bankers working on the new railroad. 30th September 1836. Berkhamsted. There was a great riot here today. A party of Irish navvies passing through the town were attacked by parties of navvies working on the L&B railroad. The Irish navvies were knocked down, severely beaten, stones thrown at them, and dogs were set on them to tear them. The Irishmen returned again later in the day, and there was a great riot in the town. Several inhabitants of the town assembled and took some of the rioters into custody. There has been a lot of disturbances in the neighbourhood with these men, many of whom are but rough uncouth savages, as fierce as tigers. 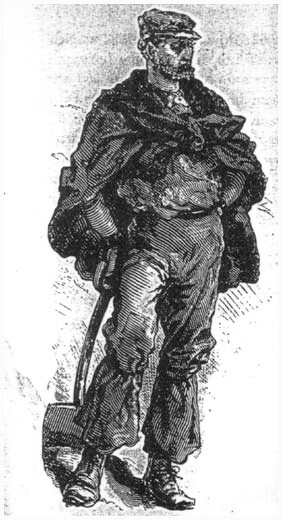 “These banditti, known in some parts of England by the name ‘Navvies’ or ‘Navigators’, and in others by that name of ‘Bankers’, are generally the terror of the surrounding country; they are as completely a class by themselves as Gipsies. Possessed of all the daring recklessness of the Smuggler, without any of his redeeming qualities, their ferocious behaviour can only be equalled by the brutality of their language. It may be truly said, their hand is against every man, and before they have been long located, every man’s hand is against them; and woe befall any woman, with the slightest share of modesty, whose ears they can assail. 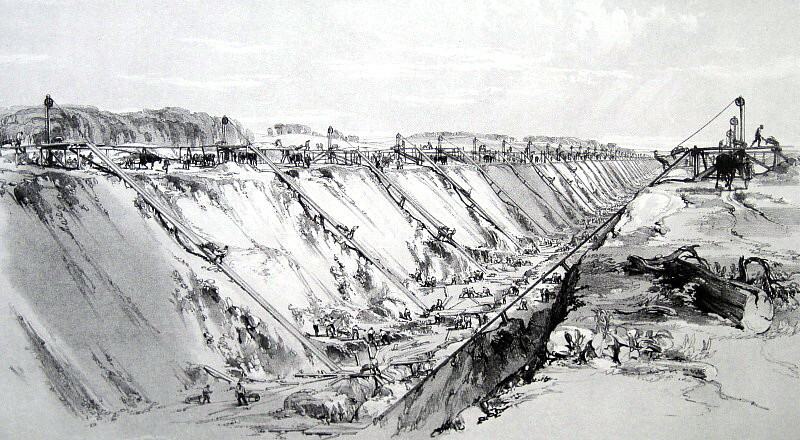 “In February 1836 Frazer [an engineering contractor] took a contract to dig ballast at Tring; and I was sent down to have charge of the job; on which there were about 50 men employed. The job was bravely started, and things went on smoothly enough for the first ten days, when, lo! It was reported that there was a bogie [gremlin] in the ballast pit. These men who could defy alike death and danger became panic stricken. The idea that the pit was haunted filled them with a mortal terror, of which the infection heightened as it spread. 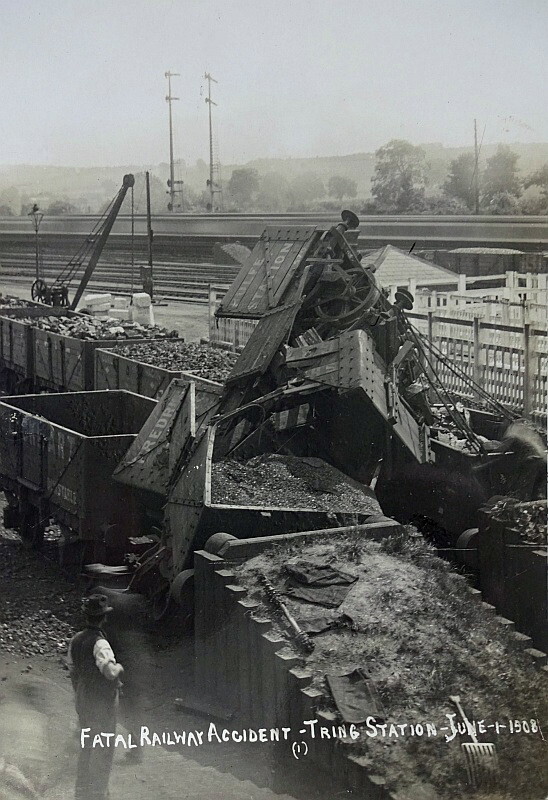 At first the current rumour was that picks, shovels, and barrows were moved from their places nightly by the bogie; then it came to be that earth was dug, barrow-runs broken up, tools spoiled, trucks shunted, and even tipped by his nightly visits . . . . Finally the men struck work in a body. Reasoning with them was useless; the old ganger, as spokesman for the rest, declared as the result of his former experience that ‘there was no tackling the old un’ [the Devil], and to a man they refused to re-enter the pit. . . . . Frazer came down the same night, bringing with him a band of chosen roughs from Watford tunnel . . . . Frazer expected much from this gang; and the next morning they commenced work in earnest. But on the second day they too became possessed with the same superstitious terror as their predecessors; and they also struck. Persuasives, promises, and threats were alike unavailing; the men would not ‘go agin the bogie’; and the pit was once again deserted. ‘Navvies as they used to be’, from Household Words, Vol. XIII. (1856). 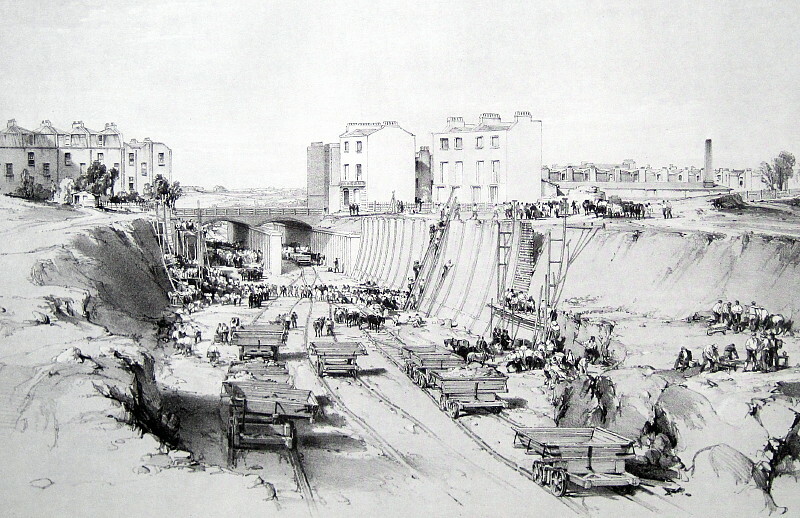 Navvies excavating a cutting near Camden on the London & Birmingham Railway, September 1836, by John Cooke Bourne. “. . . . in the summer of 1836, the fearful depravity of the men working upon the railways, and the demoralizing influence upon the surrounding population, became a matter of public notoriety; and missions were organized by various religious sections of the community . . . . It is reasonable to suppose that the same applied to a few at Tring, but it is likely that the majority were unmoved and persisted in their favourite pastimes of drinking, pugilistic encounters, and dog fighting. Apart from the dangers inherent in a navvy’s leisure hours, most of which stemmed from drink and the squalor in which they often lived (contagious disease, such as smallpox, cholera, and dysentery often struck), life in the workings was inherently dangerous in an age when ‘health and safety’ had yet to be thought of. 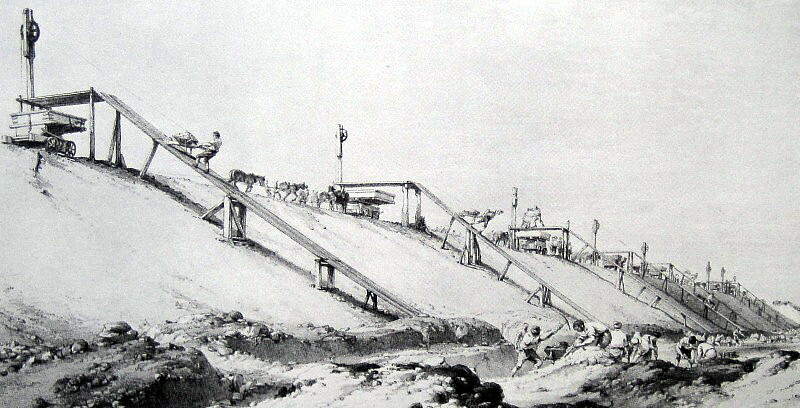 John Cooke Bourne’s famous picture showing the excavation of Tring cutting (below) illustrates just one significant risk, the ‘horse-run’. On the face of it, using a horse to haul a man up the side of a cutting, while he guided a barrow loaded with several hundredweights of spoil, might seem straight forward, but when the rope gave away or the horse panicked and bolted, the consequences could prove fatal. The Quarterly Review, Volume 103 (1858). From the Tring Vestry Minutes for 1837. Horse runs, drawn by John Cooke Bourne, June 1837. Top, at Tring Cutting. Bottom, at the Boxmoor Embankment. Above: by John Cooke Bourne, July 1837. Below: by S. C. Brees, September 1837. The London and Birmingham Railway, Thomas Roscoe and Peter Lecount (1839). Such gravel-filled fissures were cut into on several occasions, but on the 17th July 1835, there occurred a huge inrush of gravel. Ten of those at work in the tunnel were buried alive. So much for the dangers of the navvies’ work. During construction of the railway at Tring, some of the workforce are known to have lodged in the town. What little is known about Tring’s medieval Priory, which stood on the site of today’s Library, come from an account by an unnamed author published in 1838 in Railroadiana, a new history of England. After the Dissolution of the Monasteries, the Priory building served various purposes including, from 1718, use as Tring’s House of Correction, later renamed the Workhouse. It was then converted into a residence for farmer William Beal, part of which he used as a lodging house for ‘travellers of the working class’. Abolished by a despot’s Law. Made tyrant priests and monks despair. From knaves who truth and virtue mocked. Came “Heaven directed to the Poor”. And those who dig until nightfall. A horse enjoys the only stall. Is now the scene of cheerful toil. And mirth inspired by home-brewed ale. “William Brown – Desirable opportunity for carpenters and builders. Directed to sell by auction on Wednesday 30 March 1842 at one o’clock. The Aylesbury News & Advertiser, 26th March 1842. London & Birmingham Railway Bury 2-2-0 passenger locomotive No. 32 heading a mixed train. The first carriage is a Grand Junction Railway travelling post office, an example of which is on display at the National Railway Museum, York. It is followed by a second-class and then by several first-class carriages. The cylinder-like objects projecting from the carriage roofs hold oil lamps (it appears that second-class passengers didn’t qualify!). 16th October 1837 – Today the new London & Birmingham railroad was opened as far as Tring. The Directors and a few friends made an experimental trip in six carriages, and the fineness of the day contributed to the pleasure of the journey. They completed the distance to Harrow by 25 minutes after nine, to Watford 37 minutes after nine, and to the Station at Boxmoor by 9 minutes before ten o’clock. The train here entered on the new line of rails. Immediately after leaving Boxmoor Station there is an embankment of very considerable length, at the conclusion of which there is a short cutting of a few feet in depth, and a tunnel immediately following the tunnel is only 300 yards in length, and the inconvenience which has been complained of is passing through these at the earlier part of the railroad, and the want of light therefore was scarcely felt. 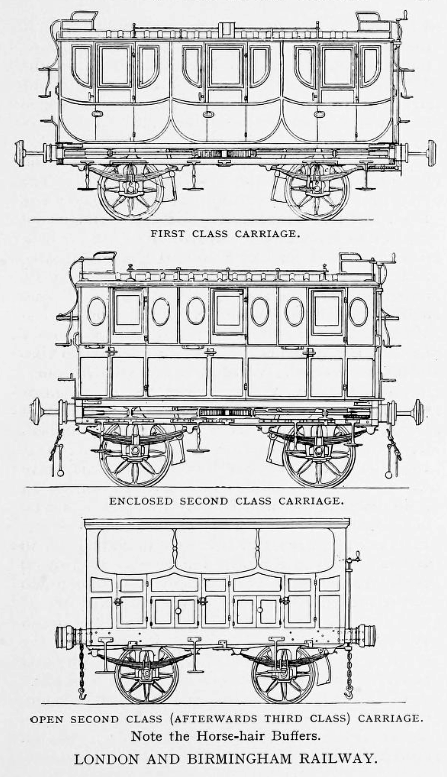 An arrangement has been made with a view to remedying this defect entirely, by the introduction of lamps into each carriage; the regulations, it is intended, shall extend to carriages both of the 1st and 2nd class, and the object is to be effected by placing oil lamps in apertures in the roof of each carriage. 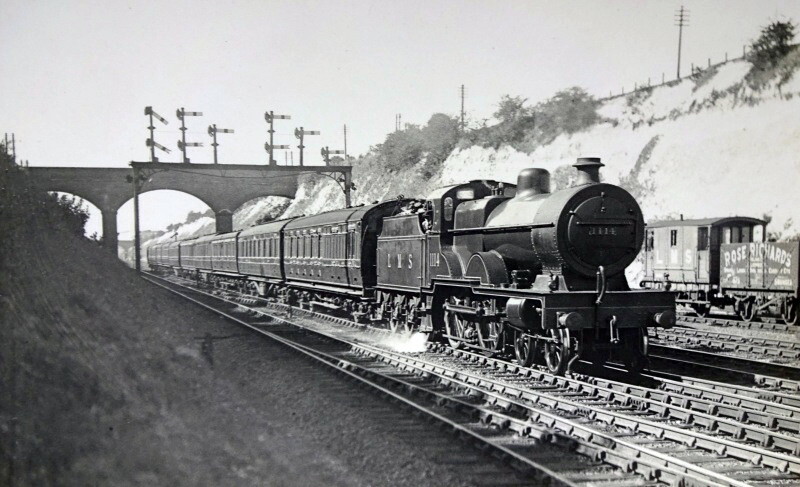 The train passed through Berkhamsted Station at precisely ten o’clock, and concluded its journey without any accident or mistake by arriving at Tring (that is Pendley) at 10 past ten o’clock, thus having covered the whole distance from Primrose Hill in an hour and 11 minutes. The line of rails now laid down does not extend more than 100 yards beyond the station, and concludes there in a deep cutting about 55 feet below the level of the earth, in soil consisting entirely of chalk. The point at which this excavation is made is the highest point of the whole line of the railway from London to Birmingham, and its level is 300 feet higher than that of the station at Euston Square, a gentle acclivity therefore, extending through the whole distance. The journey, when the railroad is completed, will be performed from London to Birmingham in eight and a-half-hours, but as soon as the rails are completed the whole distance, there is little doubt that the mails will be carried in little more than four hours, and to Liverpool in eight and a-half, or thereabouts. The object of the Company at present, however, is not so much to procure speed as to secure the regular passage of their carriages, and every train will be regularly timed on reaching its station. Several extra engines are now in the course of building, and at the next opening of rails, eight will be kept at all times ready to be called into work, although three only is the number required to be used every day. 18th August 1838 - London & Birmingham Railroad. Extract from the Directors’ Report. The number of passengers conveyed to and from London and Boxmoor, has exceeded all expectations. The numbers being as follows – on 16th ult. – being 28 days from the first opening 39,855, being an average of 1,423 per day ,for which the daily receipts average £153; during the last week, the daily number has advanced to 1,807, the receipts being £189. 17th November 1838 – The L&B railroad is finished all through, and a train started from Euston Grove and reached Birmingham in four hours and a quarter. Aylesbury News & Bucks Advertiser, 21st October 1837. It is well known that where a railway opened in competition with a canal, the canal’s trade suffered badly, to the extent that some canals quickly went out of business. What is less well known is that adjacent turnpike roads were similarly affected, the advent of public railways being one of the factors that brought about the end of the turnpike road system. In 1823, George and Robert Stephenson together with two business associates set up the locomotive manufacturing firm of ‘Robert Stephenson & Co.’ The firm was based in Newcastle-upon-Tyne, and for many years manufactured locomotives for both the home and overseas markets. 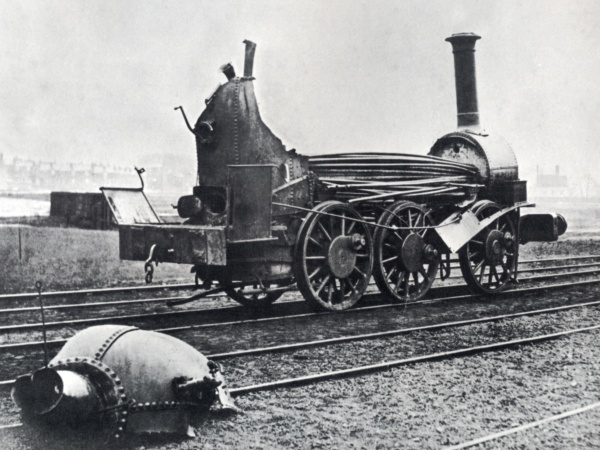 Its first four engines, built for the opening of the Stockton and Darlington Railway, were something of a disaster, but the Rocket, built four years later for the Rainhill Trials, proved to be a landmark in steam locomotive design. 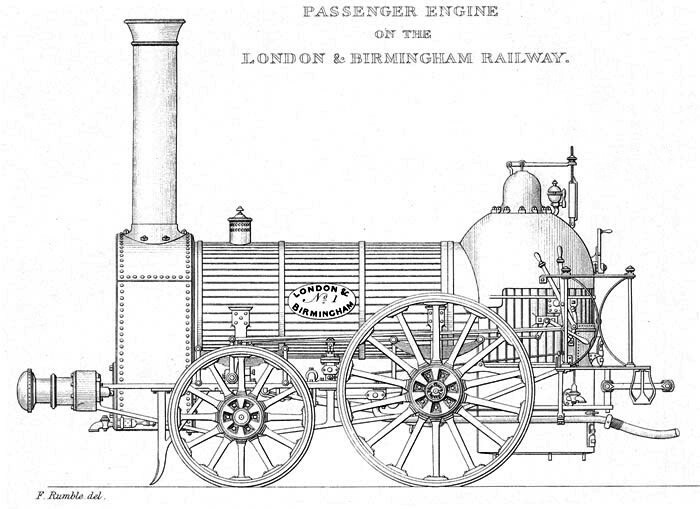 In 1833, Stephenson introduced his Patentee class locomotive. It too was a tremendous success, and in 1836, William Cubitt, the contractor for the Berkhamsted section of the railway, agreed to use one as a works engine; Stephenson’s aim was clearly to demonstrate its potential to the directors. The locomotive was shipped to London and then up the Grand Junction Canal to Bourne End, where it was assembled at Pix Farm and, under the name Harvey Combe, was put to work on the line. The Harvey Combe, pictured at Berkhamsted in July 1837, by John Cooke Bourne. But when it came to procuring locomotives for the working railway, the Directors awarded the contract to the Liverpool locomotive manufacturer, Edward Bury, who undertook to convey each passenger at a farthing per mile, and each ton of goods at a half-penny a mile, using locomotives built to his specification. Bury was a believer in small engines. Those that he supplied to the railway were four-wheelers, so heavy trains had to be hauled by two, three or more locomotives. 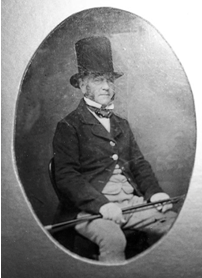 Although the service contract with Bury was soon abandoned, he continued in a salaried position as Locomotive Superintendent until shortly after the mergers took place in 1846 from which was formed the London and North-Western Railway. Drake’s Road Book of the London and Birmingham Railway (1838). Third-class carriages arrived on the London and Birmingham line some time later, this unfortunate class of traveller inheriting what had previously been the second-class day carriages, the occupants of which ran the risk of being blistered by flying sparks and cinders, and smothered with dust in the tunnels. Contemporary illustrations show them with raised umbrellas and parasols for protection, and with pieces of net draped over their top hats. 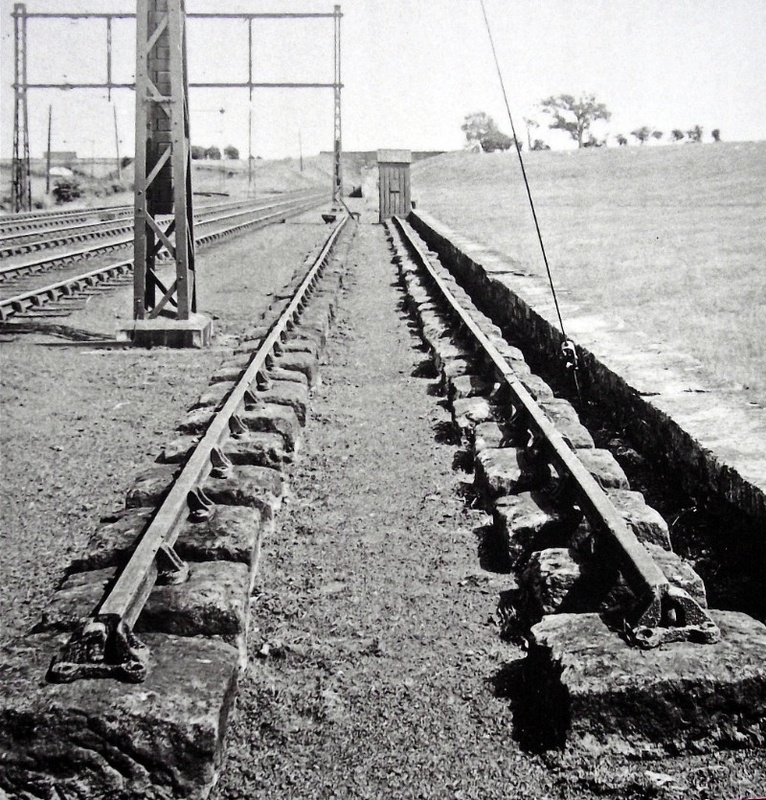 Train journeys were improved for everyone when it was realised that the stone blocks on which the rails were laid did not lend themselves to a comfortable ride, and they were soon replaced by more vibration-free wooden sleepers. History of the London & North-Western Railway, Wilfred L. Steel (1914). “The railway guards also had an unpleasant time, for, adhering to old usage they too rode outside on the top of the carriage, where, amidst other disagreeables, their clothes sometimes caught fire. The roadside stations were enclosed with lofty iron railings, within which the passengers were imprisoned until the train arrived; they were then permitted to rush out to take their places, for which they sometimes had to join in a free fight [not a great change there!] . . . .
Fifty years of the London & North Western Railway, David Stevenson (1891). The Royal Family did not become patrons of the line immediately. 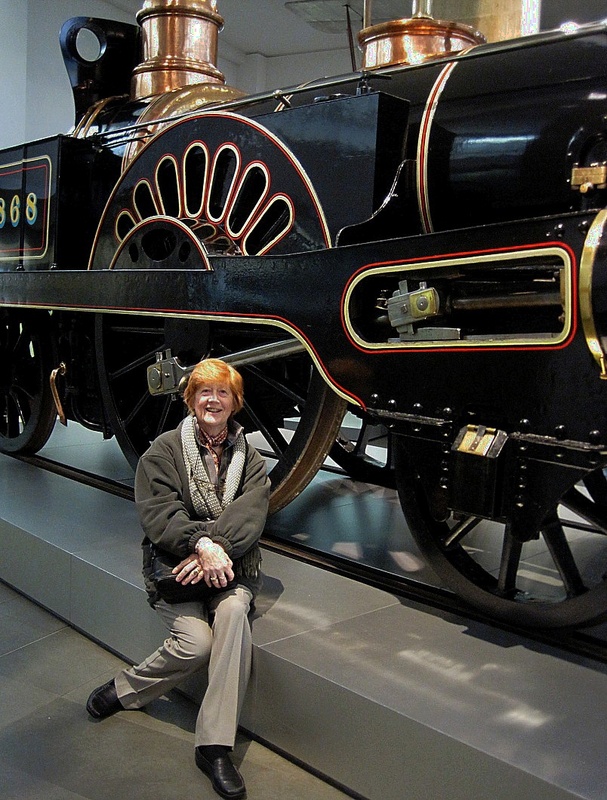 In 1842, the Company built a private coach for Queen Adelaide (now displayed at York Railway Museum). In the same year, Queen Victoria took her first rail journey, travelling from Slough to London on the Great Western Railway. From then on, she became a regular rail traveller. On one of her earlier trips on the London and Birmingham Railway, the Company provided a four-wheeled carriage, which was centrally heated. 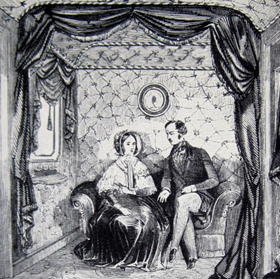 Inside the saloon was a throne-like armchair upon which the Queen sat when in public, and a more comfortable sofa hidden behind curtains for use when travelling. The roof was domed, its central ventilator outlet being disguised as a royal crown! “. . . . the engine, which was driven by Mr. Bury, superintendent of the locomotive department, was attached, and immediately afterwards, at 22 minutes past nine o’clock, the train started, amidst the cheers of spectators. It went very briskly . . . . In the centre of it was a magnificent carriage surmounted with a Royal crown . . . . many a labourer and farmer on the railroad side left the labour of the field to look at the Royal special train as it rushed rapidly along . . . . The morning was gloomy and rainy, but, notwithstanding this, and notwithstanding the advanced period of the year, there was something attractive in the landscape as the train approached Tring, owing to the varied and wooded character of the scene. The drizzling rain which was falling at the time had not deterred a considerable number of persons from collecting together at Tring station. This station is situated 31¾ miles from London, and was reached by the special train conveying Her Majesty at fourteen minutes past ten o’clock; and here the train halted for a few minutes, in order that the engine might obtain a fresh supply of water. The crown on the carriage roof disguised a ventilator cowl. The Northampton Mercury, 16th November 1844. The Bucks Herald, 14th October 1837. “The Public are informed that none of the Company’s porters or servants in attendance are permitted to receive any gratuity, and that a book is kept at every station, where passengers are requested to note down any act of incivility or inattention of any of the servants (stating the number on the collar), and immediate attention will be given to the complaint by the Directors. Females are in attendance on the ladies at the London, Watford, Wolverton and Birmingham stations, and there is a rest at Wolverton of ten minutes for refreshment. Dogs will be charged for according to distance but they will on no account be permitted to accompany passengers in the carriages. Smoking is strictly prohibited both in and upon the Carriages, and in the Company’s Stations. Any Passenger persisting in Smoking after being warned not to do so, is hereby subjected to a Fine of Forty Shillings, and in case of his persisting after a second warning, he will immediately, or (if travelling) at the first stopping place, be removed from the Company’s Premises, and forfeit his Fare. 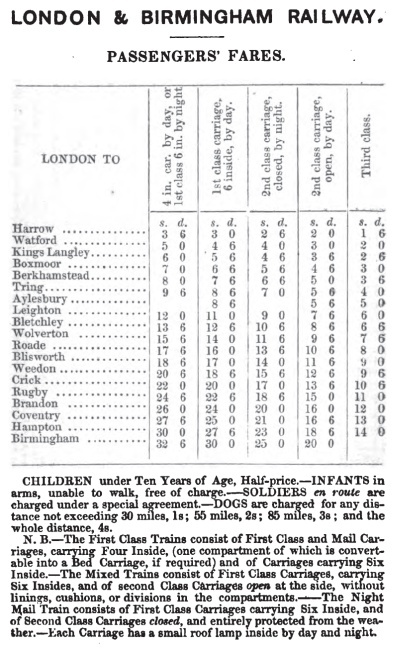 Table of fares in 1841, by which time third-class had been introduced. The list of misdemeanours for misconduct and fare dodging goes on and on, with especial emphasis on “wilfully cutting the lining, breaking windows, and defacing the number plates”, or otherwise damaging carriages. 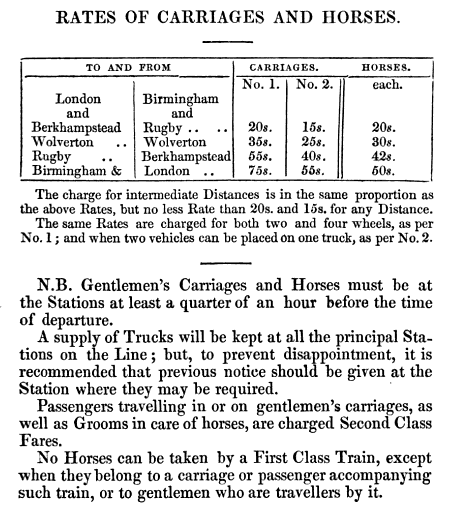 Finally, not to forget the gentry, the rates of conveyance for their horses and carriages (a sort of forerunner of Motorail) were, in 1841 . . . .
To the Editor of the Bucks Herald. “SIR. — How is it that at the important first class railway station at TRING there is neither a book stall nor a refreshment room? There are many stations of far less importance where both these establishments are thriving. I do not individually complain at the want of the latter, but any of the many passengers who go up by the 10.30 a.m. fast train (for instance) stopping at no station between Tring and London have cause to grumble that they cannot invest in a newspaper. I do not know with whom the management of these matters rests, but as I have been told that your arguments were instrumental in bringing telegraphic communication to Aylesbury perhaps you will not refuse to put forth an argument or two upon this question of lesser consequence. If a book or newspaper stall is not soon established, I shall certainly recommend the Directors of the Shoeblack Brigades in London to despatch one of the most worthy of their ‘shining characters’ to exercise the double vocation of cleaning boots in fresh country air, and vociferating ‘Morning News, Star, and Telegraph,’ and if the spec should answer ‘This Day's Times, Punch, and the Illustrated News,’ and, when anything particular is up, the Bucks Herald, and if he should not be allowed to address the public from the platform he can at any rate station himself outside. . . . . Bucks Herald, 29th October 1859. 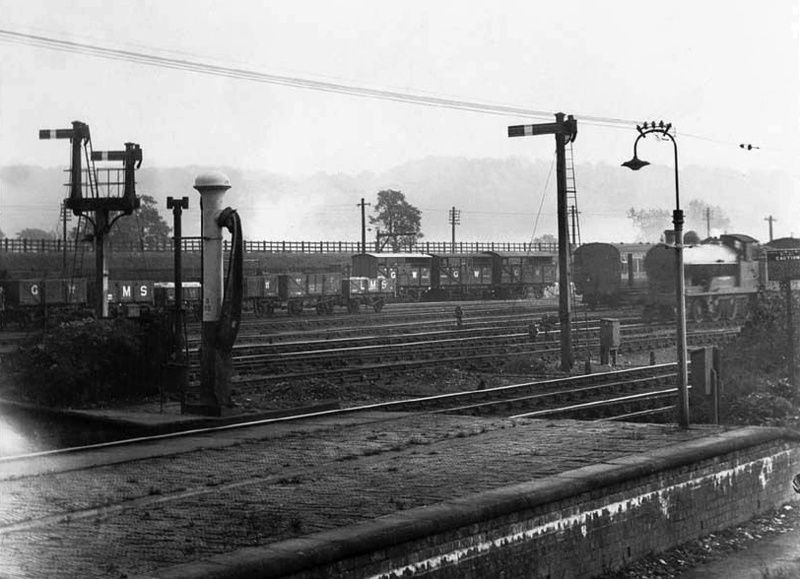 Tring Station, probably in the 1950s. Note the busy goods yard in the distance, now a car park. In his notes, Arthur MacDonald Brown first referred to Pendley Station, its original name, some 50 years after it had opened. As he was writing much nearer the event, it follows that his account of how its location came about is likely to be correct, for the oft-repeated local legend that Lord Rothschild opposed the railway being brought through the town is clearly wrong. Nathan, 1st Baron Rothschild, was born in 1840, just after the railway had opened and his father, Baron Lionel de Rothschild, did not acquire Tring Park until 1872. It was Nathan’s opposition to a steam tramway, planned some 50 years later to link Tring Station with Aylesbury, which would have passed his house at Tring Park, that is probably confused with the main line. “Memorial signed by 169 inhabitants of the town and neighbourhood of Tring praying that a station may be formed at Pendley and pledging themselves to afford the Company every facility in their power for the attainment of that object . . . . the secretary stated with reference to the memorial that a deputation from the inhabitants of Tring was in attendance”. Thus, the town got its station, albeit a good mile and a half from the town centre, for Stephenson’s determination not to exceed the railway’s ruling gradient (1:330, or 16 feet to the mile) had already determined its location. 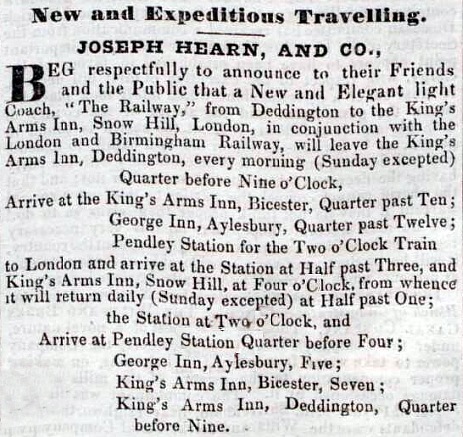 Railway Times, 7th December 1839. “TRING (FIRST-CLASS) STATION: The station at Tring is inconveniently placed in a cutting, as was the original Coventry station. The offices are on elevations equal to the depth of the cutting, and are approached from the railway by a flight of 18½ 7-inch steps for foot passengers, and a sloped road for the private carriages to be embarked or disembarked at the carriage-dock. There is a separate passage from the railway for the departure of persons arriving by the trains, and also a separate staircase for the use of the porters. The original Coventry Station, thought to be similar in appearance to that at Tring (c.1838). Architect, George Aitchison Snr. (1792-1861). The offices consist of a booking-office and waiting-room in one, with an entrance-lobby next the road, and exit lobby towards the railway. The width of this building, which is constructed of brick, is 32 ft. and the depth 24 ft.5 in. A paved yard extends in front of the offices for a length of 58 ft. being 33 ft. in depth; the front next the railway is enclosed with iron railings. The urinals and water–closets are conveniently on the north side of the offices and entered from the paved yard. There is also a porter’s lodge, which is detached from the other offices. The fixed-engine and boiler-house are about 33 ft. in length and 18 ft. 6 inches in width, and abut on the north side of the paved yard. The coal-shed, which is contiguous is 23 ft. in length and about 7 ft. wide. The engine has an 8-inch cylinder and 18-inch stroke; the usual working pressure is 31 lbs. on the square inch. There are two boilers, with return tubes. The water-tank is placed over the engine and boiler house; the usual depth of water of 3 ft. 6 in. The quantity of water which this tank will hold is equal to the supply of eight or nine locomotive engines. The supply-pipes from the pumps are each of 6 in. diameter. From the boiler the waste is admitted by a 2½ inch pipe into the water tank, to raise the temperature of the water previously to its being let into the tanks of tenders. Some of the ballast engines are housed in a shed at this station. The Railways of Great Britain and Ireland, Francis Wishaw (1842). Tring Vestry Minutes, April 24th, 1858. 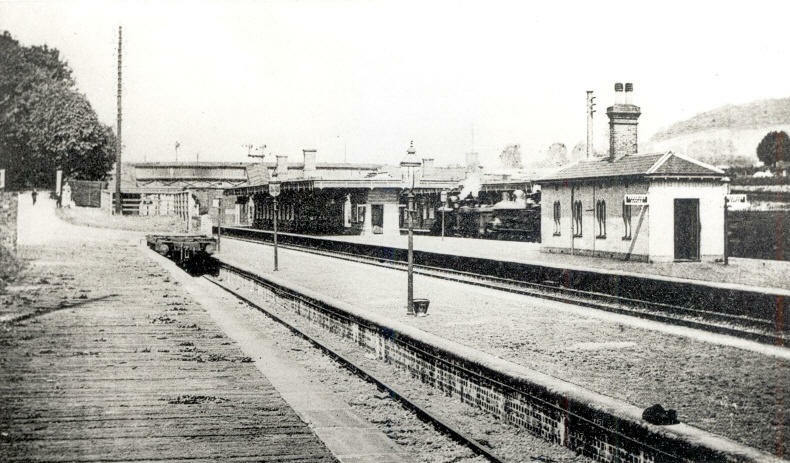 Above: Tring Station looking north (judging by the locomotives) probably during the Edwardian era. Below: Tring station booking office. The Station Masters house is on the left. Above: Tring Station yard looking south. The locomotive is probably a Bowen Cooke Prince of Wales. Below: down Euston Manchester express passing Tring behind Midland Compound 1114. EARLY PLANS OF TRING STATION. 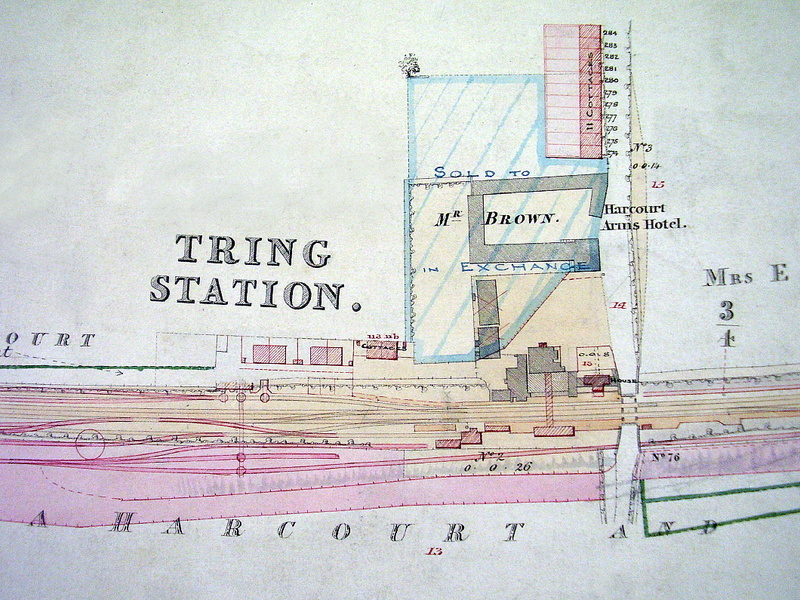 Although there is no known image of the first station at Tring, there are early plans that show its layout ― very different to that which exists today. Note the flights of stairs descending to platform level (on the plan, adjacent to the ‘Station Yard’) reminiscent of those at Coventry station (above); also the waiting rooms and urinals, both facilities that are now long gone! 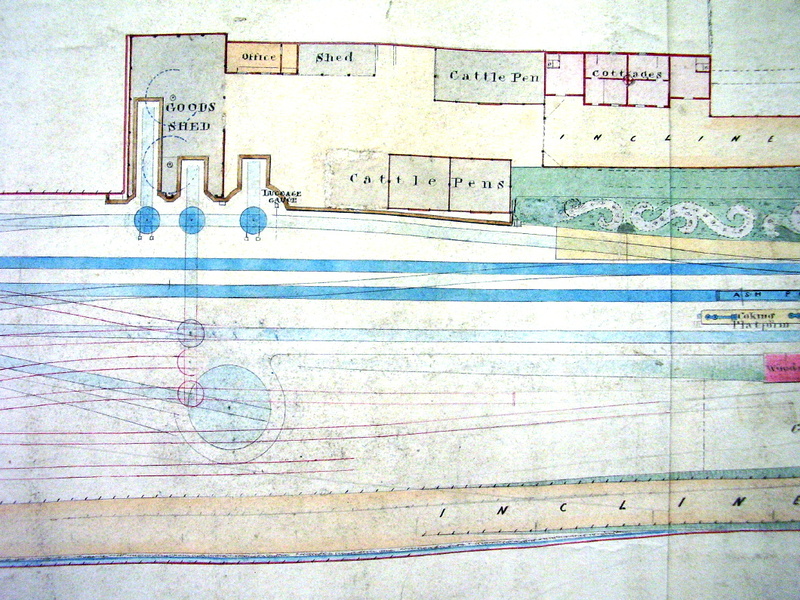 Above: an undated plan, but probably of the northern end of the station in its earliest form. Note the garden fronting the Station Master’s house, today part of the station forecourt. Below: this plan of Tring Station shows the Harcourt Arms — later renamed the Royal Hotel (now private apartments) — and above it the row of ‘railway cottages’ that stand in Station Road. The railway is double track — a third track was built in 1859, and a fourth in 1872. “TO BUILDERS AND OTHERS: To be sold by auction, by Mr. W. Brown. Above: from the days when railway company staff took pride in the appearance of their station. 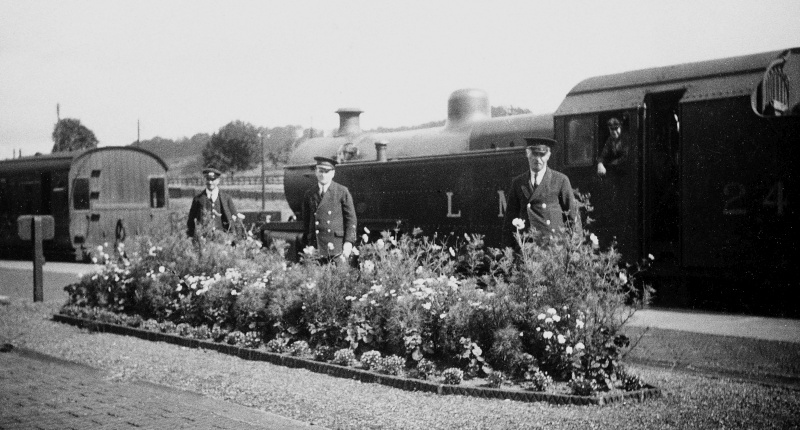 Tring’s Station Master and his assistants pose proudly behind their nicely planted flower bed, the driver of a local service Fowler 2-6-4T looking on. Below: up express passing through Tring Station behind a Bowen Cooke Claughton. Late Victorian view of the the Royal Hotel, Railway Cottages, and the original Mission Hall. Due to its relative isolation, the Company was obliged to provide accommodation for the station staff, and, in 1841, they built a row of eleven cottages at a cost of £1,286. Sited adjacent to the station and fronting the newly built Station Road, they were numbered 274-284 from Euston. Rents were reasonable at 2s.6d. and 3s.6d. a week, to which parish council rates amounted to a further 5s half-yearly. Shortly afterwards, a substantial Station Master’s house – designed to reflect the importance of his position -- was built overlooking the forecourt. In this scene, the Station Master’s house is on the right, the road to Aldbury on the left. Towards the end of the Victorian era, the Company (by then the London and North-Western Railway) built further cottages in a lane overlooking the railway, while the spiritual needs of the workers were accommodated by the provision of a metal pre-fabricated Mission Hall; this was later replaced by the larger structure known today as the Iron Room. 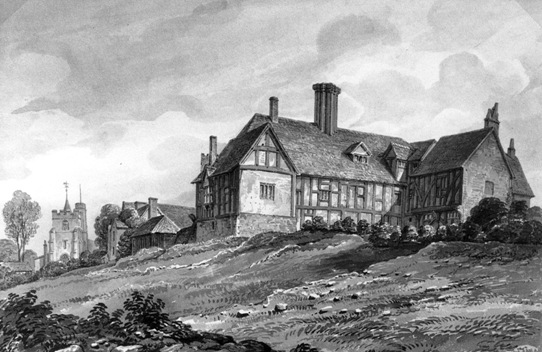 The original mission hall was moved to Puttenham, where it remains. On national census night in 1841, 20 men in the Company’s employment were recorded living in the area of Tring station. 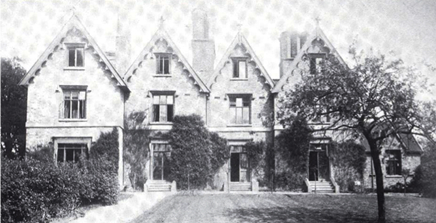 Most lived in the station cottages, three were staying at the Harcourt Arms and six lived at Tring Grove. They included four locally-born labourers, the better-paid skilled jobs being filled by incomers to the area, including two from Scotland. Among the occupations listed -- and confirmed by Wishaw’s description above -- are three porters, four policemen (whose responsibilities included operating signals and points), an inspector (of railway police), a collector (of tickets), an engineer (operator of the stationary steam engine supplying water), and two station clerks. It seems that staff turnover was quite high, for ten years later only two of the original 20 remained. Five acres of truly eligible Freehold building ground within a short distance of the Tring Railway Station, a situation which challenges comparison on the whole line between London and Birmingham, the views from it extending an immense distance over the counties of Herts, Bucks, and Beds, with the advantage of being within and hour and a half’s ride from London. In his notes, Arthur MacDonald describes how Tring brewer, John Brown, acquired the land on which to build this large hotel. A canny, business-like man from Dorset, Brown settled in Tring in 1826 where he purchased the High Street brewery from Thomas Amsden. His modest fortune was ensured when he seized the opportunity to quench the drinking needs of the hundreds of navvies engaged in building the new railway. 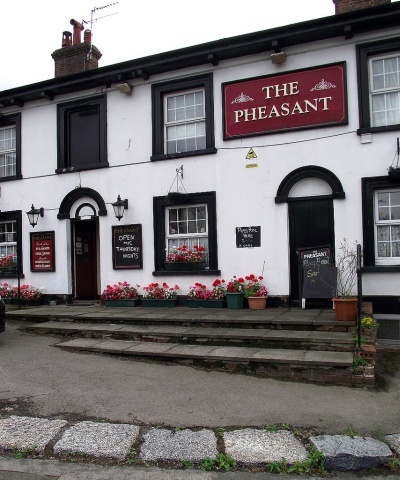 He built several public houses in the locality, most in a late-Regency style. 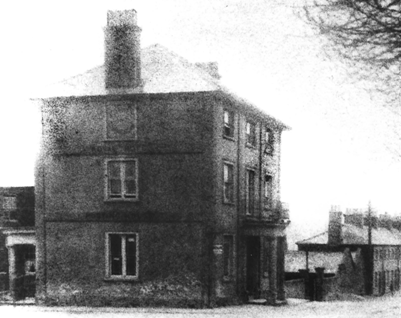 An old photograph of the Harcourt Arms, later the Royal Hotel. Bucks Herald, 16th January 1841. And bold as e’er rode o’er a grass countree. And view’d the fox from the hillside gorse. Worried a bagman and home again. The 1851 census records that the now renamed Royal Hotel had 17 grooms living on the premises, as well as other staff. Some of the grooms worked as ostlers, for stagecoaches also rumbled in and stopped under (we are told) the central chestnut tree, where horses were changed and passengers disembarked to take rest and refreshment within. 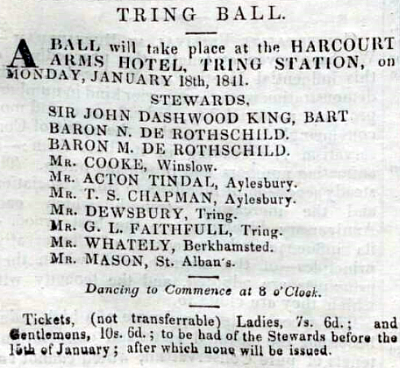 The hotel also appears to have boasted a ballroom, as the advertisement for the Tring Ball proclaims. Bucks Herald, 19th December 1840. By the time of its first AGM in 1841, the Association was in full swing. There were classes for corn, in which four bushels of grain and an average bunch of stalks had to be shown; also for roots. The winners were required to state at the dinner the kind of soil; quantity of seed; and method of cultivation of their exhibits. 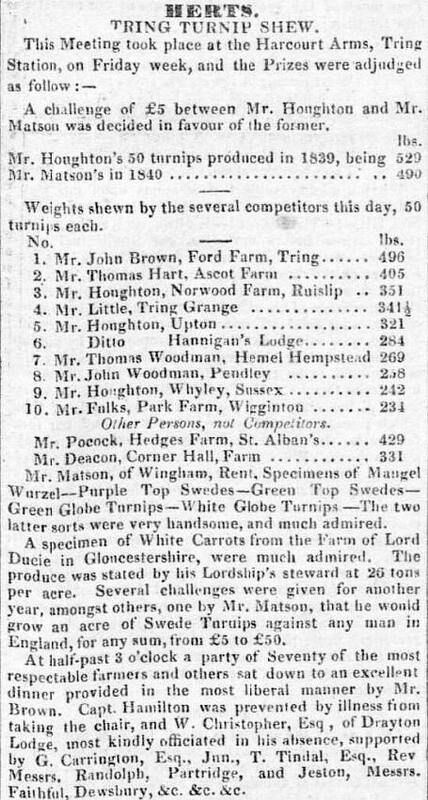 This gave rise to a discussion on the relative advantages of drilling and broadcast sowing, and “as to whether a wheat crop will remunerate the expense of hoeing.” One of the most valuable prizes, £3, was given to the largest employer of labour on his farm, and there were classes for cottage garden produce, for long service, and for the largest family supported in ‘religious and industrious habits with the least amount of Parochial relief’. Prizes were also awarded for the best plough and horse hoe. The annual agricultural show eventually outgrew the site at Tring Station and, at the instigation of Lord Rothschild, was moved to Tring Park where it gained the reputation of being the largest one-day show in the country. 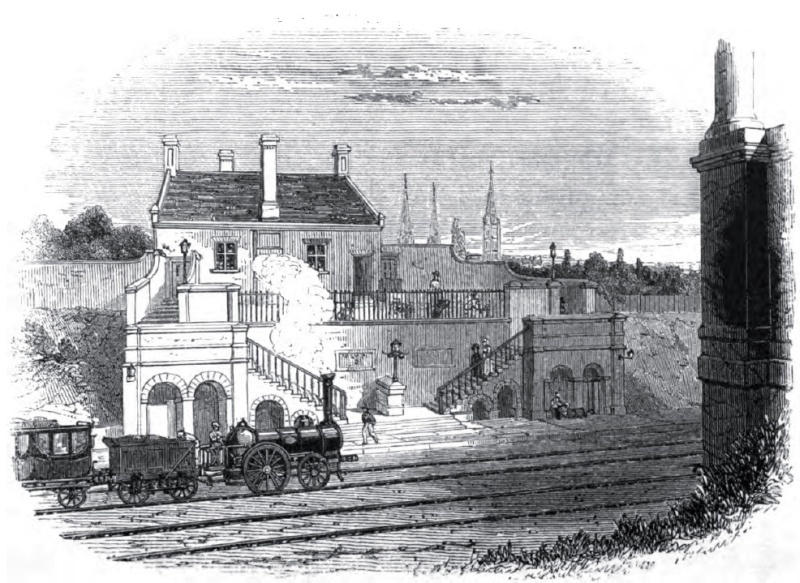 The original Berkhamsted Station stood adjacent to the Crystal Palace public house. It was designed in an Elizabethan style with a brick gabled booking hall. The Bucks Gazette, 28th October 1837. “Station Road. At the east end of the town important alterations were necessitated by the construction of the railway, and station in 1838. The traveller by road from Tring to Aldbury before that date proceeded up the London Road to Dunsley, turned back across the 3-cornered meadow, following the hedge next the present cricket ground, to the point where The Laurels now stands, and which was then the corner of Grove Shrubbery, the latter extending right round to the fir tree near the recreation ground. Skirting the shrubbery, as far as Grove Lane, our traveller would then turn up Cow Lane for a little distance, and strike across what is now Pendley Park, between the Rookery and a small spinney, emerging some little distance short of Pendley canal bridge, this latter part being the ‘Aldbury Road’ mentioned in the Inclosure Award. There was also a footpath direct from Dunsley across the farm to the point in Cow Lane, opposite the ‘Aldbury Road’, continuing across Pendley Fields (now part of the Park) and the old Pendley Park, to the Aldbury boundary. The Aylesbury News & Bucks Advertiser, April 1837. The Bucks Herald, 4th November 1837. 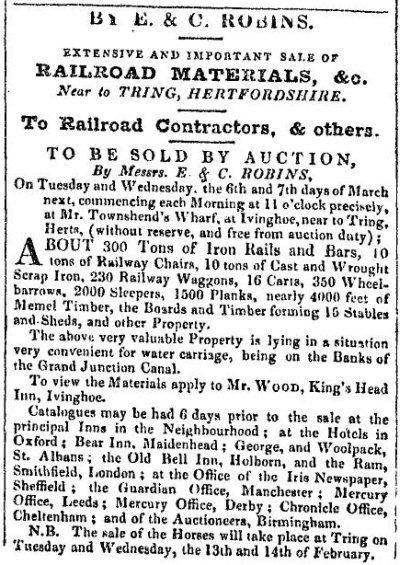 Pigot’s Trade Directory 1838 – entry for Tring. “A Coach from the Plough Inn, Tring, to meet all the trains, and an Omnibus from the Rose & Crown. 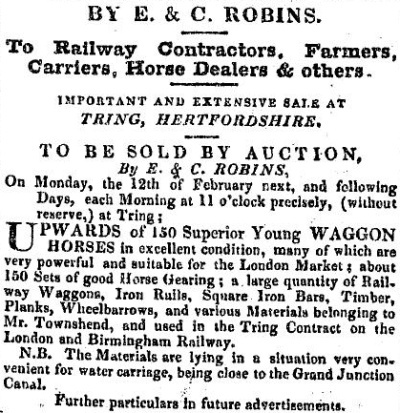 Pigot’s Trade Directory 1839 – entry for Tring. 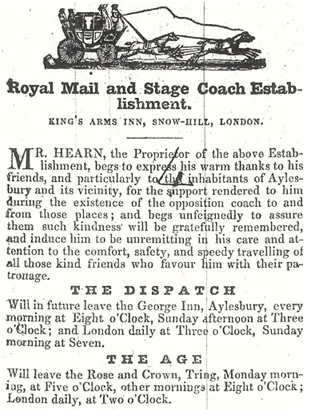 Joseph Hearn begs respectfully to announce to his friends and the public generally that he is appointed by the Railway Committee to book and luggage at his offices; The Kings Arms Inn, Snowhill and Griffins, Green Man and Still, Oxford Street where conveyances are appointed to convey passengers and luggage to the station at Euston Square to meet the departure and arrival of the whole of the trains from and to Box Moor. “CHAS. JOHSON, Bull’s Head Inn, Aylesbury respectfully informs his friends and the public that he has commenced running an Omnibus from Aylesbury to Box Moor, and back, daily. The Omnibus leaves the Bull’s Head Inn every Monday morning at a quarter after five, other mornings at a quarter to six, so as to enable passengers to go by the FIRST TRAIN to London; and leaves Box Moor for Aylesbury every evening at half-past six and arrives there at half-past eight. Bucks Herald, 11th November 1837. The Bucks Herald, 21st October 1837. 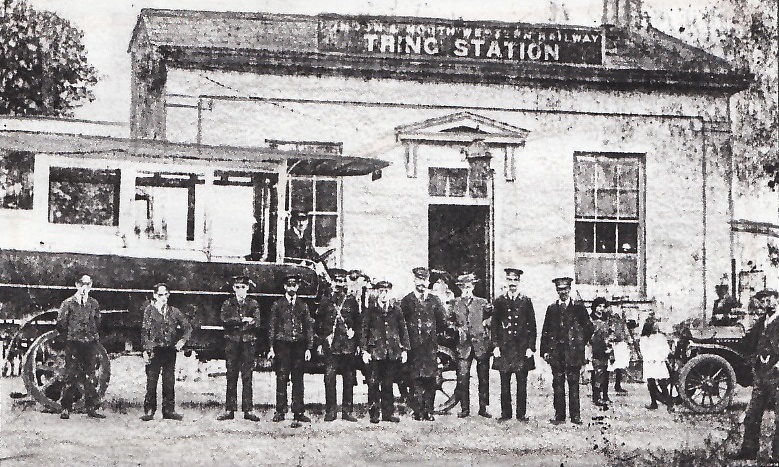 Tring’s first petrol-powered station omnibus, 1914. 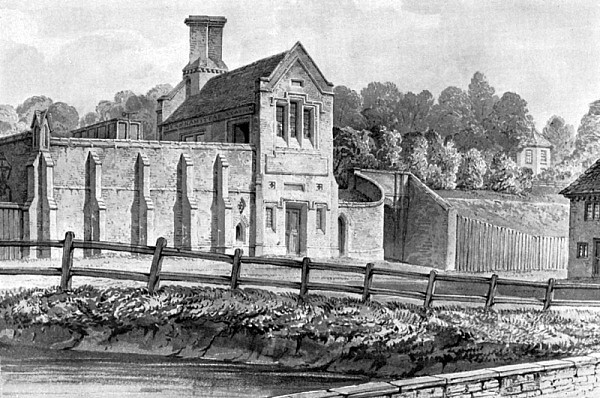 On the 10th June 1839, the world’s first ‘branch’ railway opened, connecting Aylesbury with the London and Birmingham Railway at Cheddington. Engineered by Robert Stephenson, the Bucks Herald’s reporter confidently predicted that “if the pleasure and success of the day may be taken as a type of the future prosperity of this undertaking, it will be amongst the most thriving of the Railroads in the kingdom.” That optimistic prediction didn’t come to pass – the line closed to passengers in February 1953 – but for many years the citizens of Aylesbury did have a railway connection to the wider world. How the competing coaching operators fared is another story. Aftermath of a locomotive boiler explosion c. 1850. Location and circumstances unknown. The Aylesbury News & Bucks Advertiser, 1st April 1837. 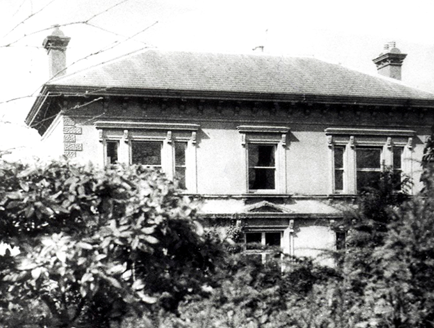 A new hospital was opened at Cheere House, Hemel Hempstead, in 1832. It was recorded that between July 1836 and July 1837, 43 railway accident patients were admitted, six of which were fatal. At first, the Directors of the railway gave a donation of £21, but as the number of accidents increased they agreed to pay 8s. a week for any employee sent to the hospital. Cubitts, the contractors of the stretch of the line from Kings Langley to the northern end of Northchurch Tunnel, made the same arrangement. The Governors were so shocked by the “numerous and dreadful cases” that they recommended to the employers concerned that a ganger or some intelligent workman be instructed in applying a temporary tourniquet. The hospital also did a brisk trade in the supply of trusses. Cases were transported to the hospital along the new line and then onwards by cart. Cheere House, West Herts Infirmary, opened in 1832 at a cost of £13,000. “Accident on the Railway – on Saturday, a man employed on the railway, in attempting to get into a wagon at Berkhamsted, while the train was going on, unhappily fell and several wagons went over him, by which he was so dreadfully crushed that he died the same night in the West Herts Infirmary. Aylesbury News & Bucks Advertiser, 8th April 1837. Bucks Herald, 7th September 1839. The Yorkshire Gazette, 21st September 1839. John Tomlin, of Boxmoor ― severe injury to the head and fracture of ribs. Mary Bye, of Aylesbury ― severe injury to the head. John Pemberton, Company’s stoker, concussion of the brain. Matthew Lowe, overlooker, Berkhamstead ― injury to the back. Yorkshire Gazette, 10th December 1842. Herts Mercury, 24th July 1847. Tring Vestry Minutes, 8th December 1842. The Times, 23rd March 1846. Tring Vestry Minutes, 10th August 1846. The Bucks Gazette, 8th July 1837. The Bucks Gazette, 21st October 1837. “. . . . Let the profession and the public hear the plain and naked truth. The evidence which we have to offer has been received from the lips of the persons, who really did discharge, with care and benevolence, the obligations of humanity on that trying occasion . . . . Is it true, then, that Sir Henry Halford ‘took Mr Lockley out of the carriage, and carried him into the inspector’s parlour?’ Is it true that he even saw either of these things done? No, is the reply; and, incredible as it may appear, the officers of the railways who took the all but lifeless body of Mr. Lockley from the carriage, did not even conjecture that the President of the College of Physicians was the ‘friend’ or even an acquaintance of the object of their solicitude! What then did really happen at the station? . . . . the train having arrived, the officers were beckoned to one of the carriages, and thus accosted by a venerable-looking personage within . . . . Did this ‘friend’ even get out of the carriage? He did not, but, frightful to relate, actually flew off with the train, leaving his senseless and speechless friend in the open road, supported in a chair placed on the cold clay by the hands of official strangers. It is unsurprising that very soon after his ordeal, Mr. Lockley expired, and although Sir Henry robustly defended his actions the newspapers continued to heap opprobrium upon him. The Bucks Herald, 6th June 1908. In 1846, the London and Birmingham Railway Company merged with the Grand Junction and the Manchester and Birmingham railway companies to form the London and North Western Railway. By the late 19th century the L&NWR had grown into the largest joint stock company in the world. However, the great pressure placed on our railway network during World War I. together with little opportunity or resources for proper maintenance left it in a sorry condition, and, when peace returned, it was losing money. The government of the day aimed to remedy the situation by imposing a merger on most of the 120 railway companies then existing . . . .
From The Railways Act 1921. In 1923, in what became known as the ‘grouping’, four large railway companies were formed from this merger, the L&NWR becoming a constituent of the London, Midland and Scottish Railway (LMS), the direct ancestor of today’s West Coast Main Line. During the inter-war years competition from road transport intensified, while a further lack of maintenance during World War II. again left our railway system in a very run-down condition. In 1947, under Clement Atlee’s Transport Act, the majority of the U.K.’s railways were nationalised (together with road transport, waterways and docks, all coming under the unwieldy ‘British Transport Commission’) to form ‘British Railways’. Although from the travelling public’s point of view controversial, British Railways did set about modernising our railway network by pruning the deadwood, perhaps excessively! 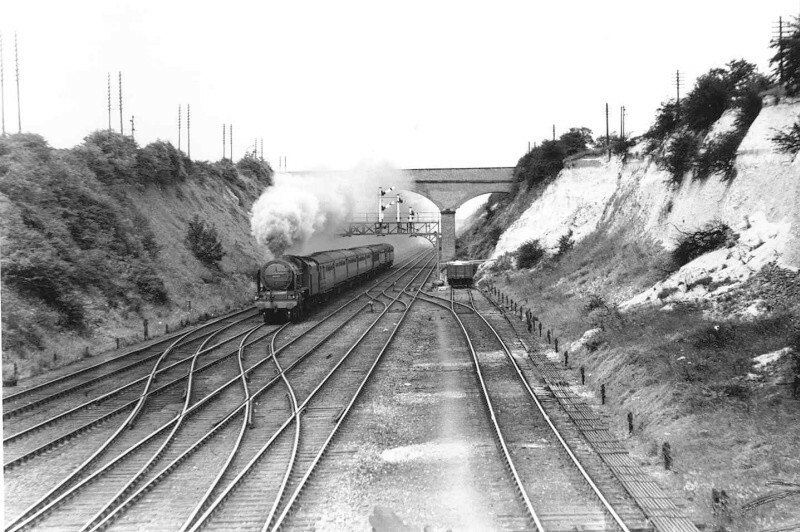 The first section of the West Coast Main Line to be electrified – from Crewe to Manchester – was completed in September 1960 to be followed in March 1967 by the southern section corresponding to the former London to Birmingham Railway. Were he to return, Robert Stephenson would find very little resemblance between today’s railway and that which he built. Although much of the original civil engineering remains it is festooned with high-tension cables and associated paraphernalia, tampered with by trackbed widening schemes and often obscured by modern development. Another very noticeable change would be to the size and speed of the rolling stock, made possible in part by the heavy gauge, continuous welded steel rail, laid on pre-stressed concrete sleepers in a bed of crushed granite ballast. Likewise, colour light signals have replaced the top-hatted ‘policeman’ with their flags and signal lamps, stationed in the open at points along the line. The changes that have been made to station architecture would astonish and probably appal him – one wonders what he would make of today’s utilitarian but æsthetically deprived termini! Almost none of the Railway’s original station architecture remains, its intermediate stations having being rebuilt (and sometimes relocated) within a few years of its opening. As a coup-de-grâce, the remnants of its two great termini, at Euston and at New Street, succumbed to the architectural vandalism of the 1960s. Top: Euston Station in 1838, by John Cooke Bourne. 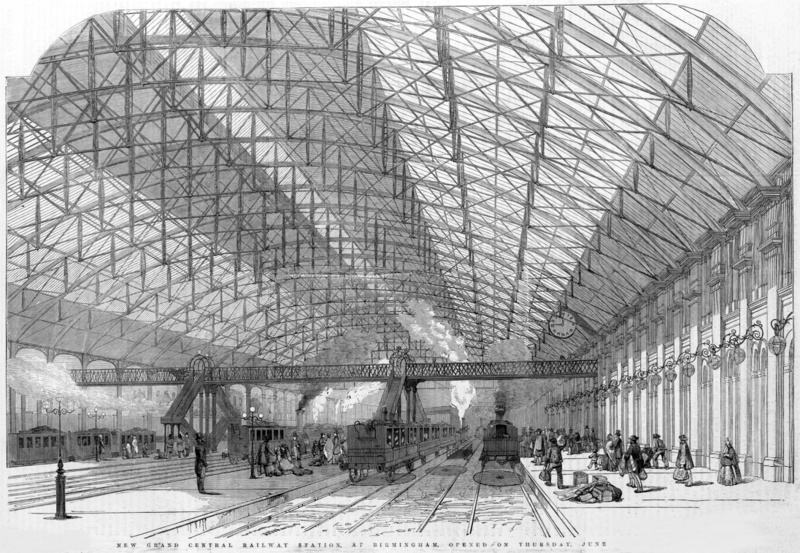 Below: Birmingham New Street Station c. 1855, Illustrated London News. At Tring, the railway has seen many changes over the years. The track-bed has twice been widened, first to accommodate three tracks (1859) and then four (1876), extensive goods sidings have been built and then replaced by car parks, station buildings have come and gone (together with their public conveniences), and the Railway has been electrified. But a few reminders of the old London and Birmingham days remain; the long straight road leading to the Town, the row of station cottages at its eastern end, and, perhaps, the only true survivor, the Royal Hotel (now converted to apartments). Riotous behaviour among the railway navvies. 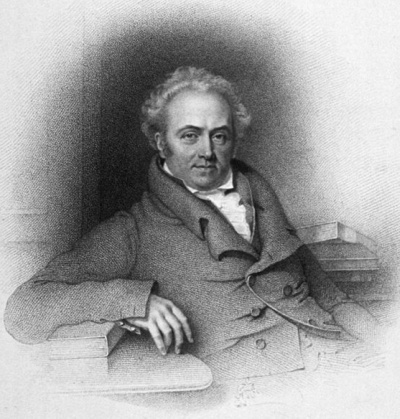 Depositions of Samuel Williams, who says that on the 25th instant from between seven and eight in the morning until six o'clock in the evening, as certain Irishmen were passing through the town of Berkhampstead they were attacked by parties of the labourers working on the London and Birmingham Railway who set dogs upon them. About six o'clock on that evening he saw a party of Irishmen about twelve in number passing through the town, and when opposite to a beershop kept by Mary Foster which is opposite to deponent's house he saw a number of labourers (seven or eight) come out of that house and attack the Irishmen. They first hooted at them and struck them with their fists, and as the Irishman ran away they threw stones at them and set two dogs at them which appeared to tear them. The prisoner, William Stubbs, was one of the labourers who came out of the beershop and appeared to be the leader of the gang. The Irishmen were very much exasperated and came back when the labourers retreated into the house, and several inhabitants of the town assembled and took Stubbs into custody. A large number of railway labourers assembled on the occasion and there was a great riot in the town. William Morris bears out the above statement and says the Irishmen were knocked down, beaten, and kicked unmercifully; Samuel Williams bears testimony to the above likewise and was present at the taking of the prisoners. Joseph Elliott, constable, of Hemel Hempstead, deposes that in obedience to a warrant he apprehended Joseph Adams on 21st of August last. Whilst conveying him to detention in his cart he was stopped by twenty or thirty labourers, some armed with great flints and others with spades, and they threw at him and threatened to kill his horse and himself if be did not liberate the prisoner. Two of the men then pulled out their knives to kill the horse. Whilst they were round the deponent the prisoner Adams jumped out of the cart and made his escape. Deponent went after him but could not find him again until the following Sunday when he took him in his own house. Deponent does not know any of the men who rescued the prisoner. Information of John Hughes, sub-contractor of the railway, residing at Box Moor, in the parish of Hemel Hempstead, concerning Joseph Adams, charged with a riot. The said John Hughes states that on the 21st of August last he did let some work on the line of the railway at Box Moor to some men of the county who were working there about six o'clock on that morning, when they were attacked by some men who he had also employed the week before, but who had been discharged on the Saturday night on account of their refusing to work by the piece. Those who continued to work by the piece, about 30 or 40 in number, went there for the purpose of working on the Monday morning, the 21st August, when they were attacked by those who would not work by the piece, numbering 40 or 50, who pelted them with chalk, and hooted at them and abused them and drove them from their work. Their desire was to prevent the workers from working by the piece, and compel them to return to work by the day. The workers were thus obliged to leave their work until informant had been to a magistrate and obtained the assistance of a peace officer. The party persisted in attacks for an hour and upwards, and the prisoner, Joseph Adams, appeared to be one of the ring-leaders. Thomas Greenhill, superintendent on the railway at Boxmoor, confirms the above statement. Notes from the History of Tring, Arthur MacDonald (Brown), c.1890. History of the Railway connecting London and Birmingham, Lt. Peter Lecount R.N., F.R.A.S., C.E. George and Robert Stephenson, Michael Robbins, pub. 1966. Extracts from the correspondence of Robert Stephenson. Archive copies of The Times, The Aylesbury News & Bucks Advertiser, The Bucks Gazette, and The Bucks Herald, and other daily and local newspapers. A History of the London & Birmingham Railway, Vol.1, London to Bletchley, Peter Richards and Bill Simpson, pub. 2004. History of Hemel Hempstead, Susan Yaxley, pub.1973. Tring Gardens, Wendy Austin, pub. 2006. Railways of Dacorum, catalogue to accompany exhibition 2000, C. J. Goldsworthy. The Mechanics’ Magazine, Vol.23, 1835. Tring and the Railway, Hertfordshire Past and Present, No.19, article by Peter S Richards, Spring 2012. The New Sporting Magazine, 1846. Census returns for 1841 and 1851, and sources as quoted in the text.